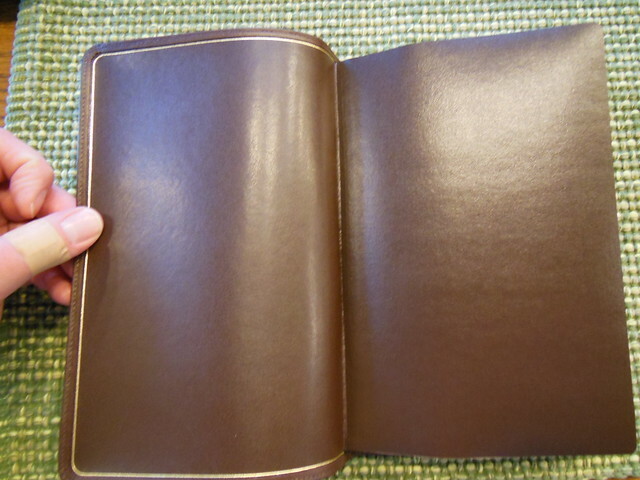 Let’s see what the 2015 New Classic Reference looks like, and compare it briefly to the edition it replaces. 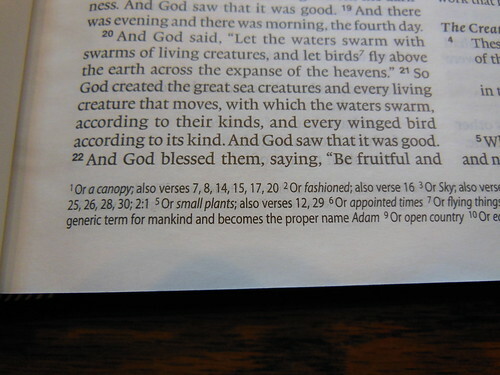 I think you’ll find that there aren’t very many changes. 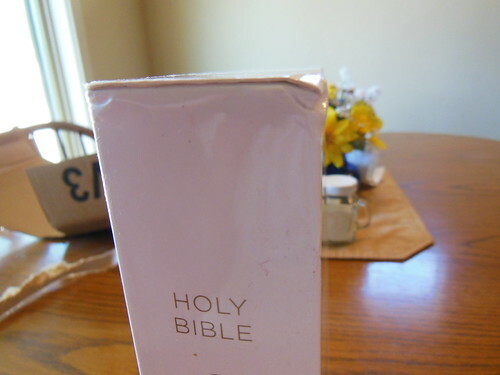 I ordered this Bible from Amazon. 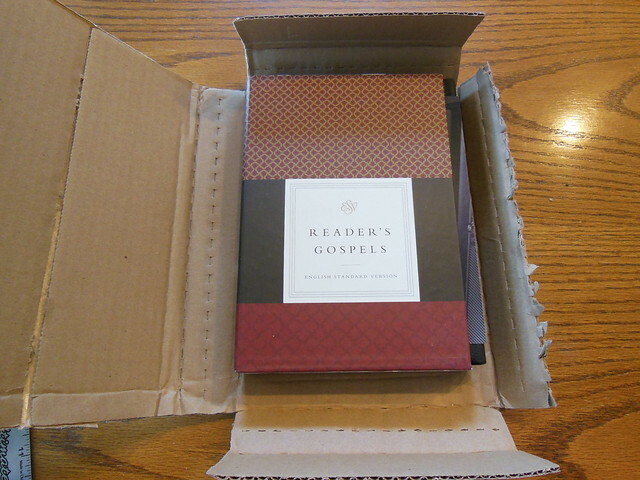 It arrived in generally good shape. 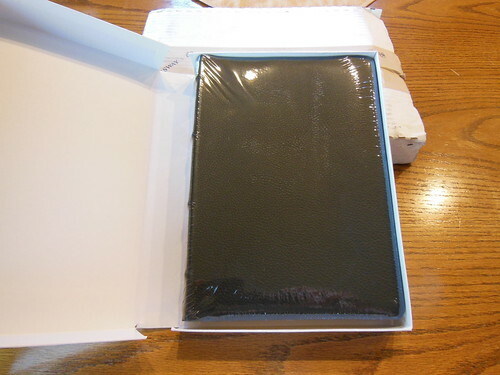 It does not have a retail box. 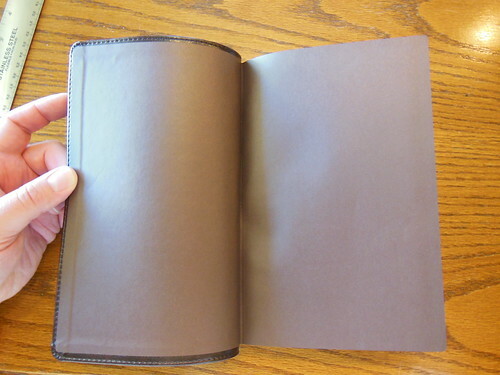 Instead, it has a sleeve. 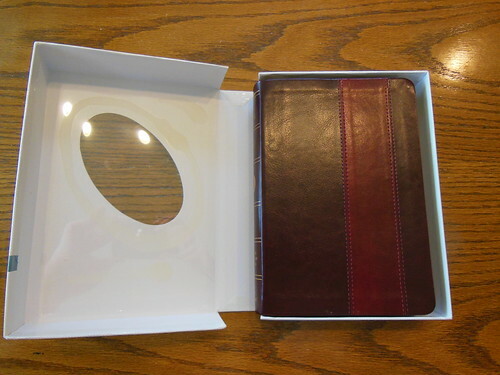 I prefer clamshell or two piece style boxes for storage. 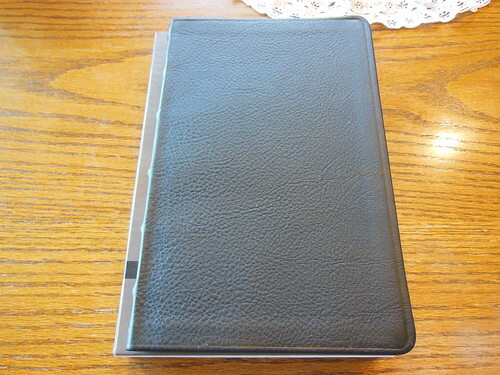 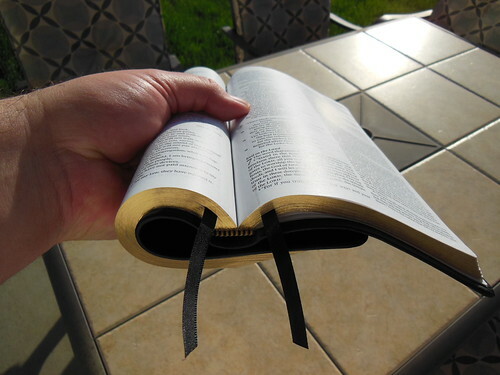 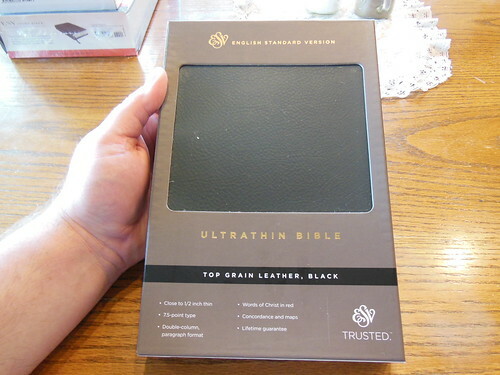 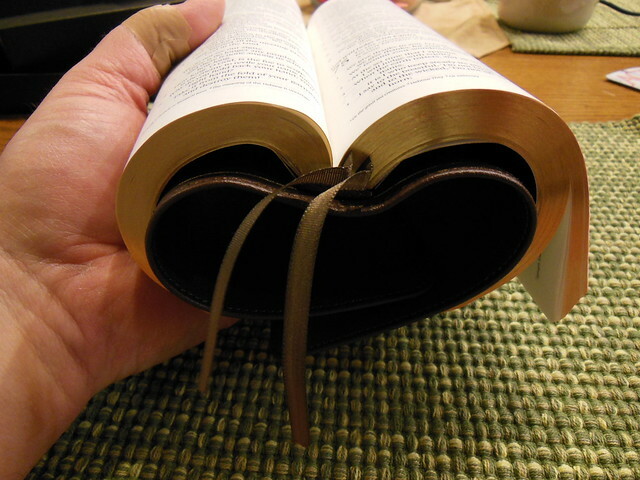 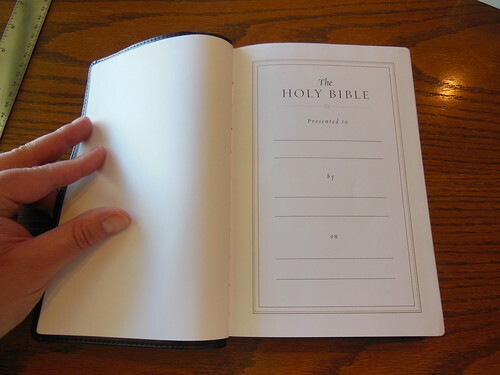 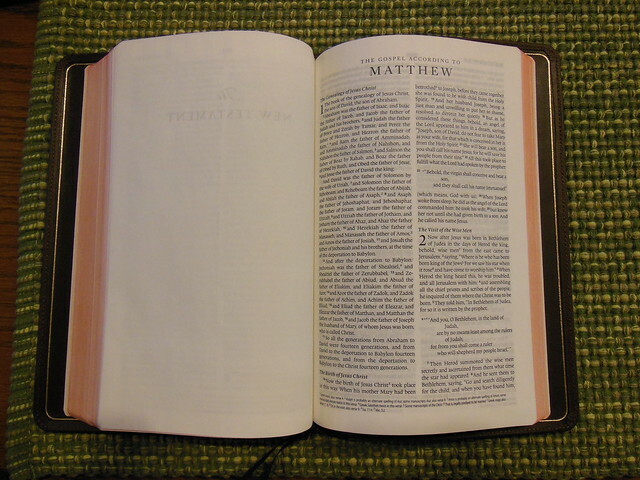 You tend to see clamshell style with premium Bibles, not value editions. 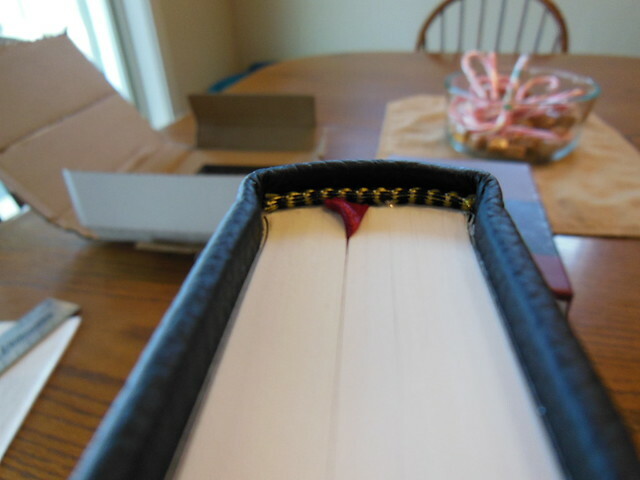 After tossing the sleeve away, I scrutinized the cover. 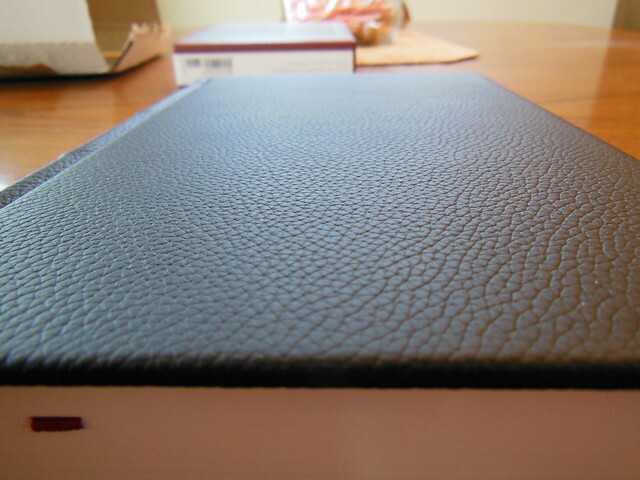 I like synthetic covers more than bonded leather. 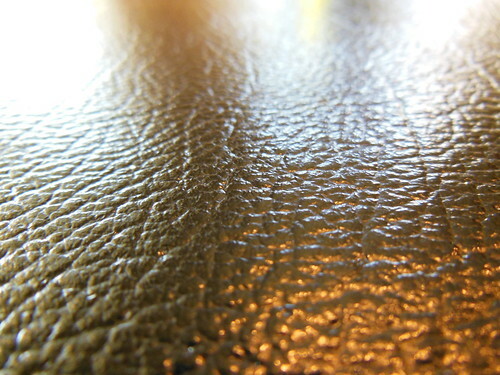 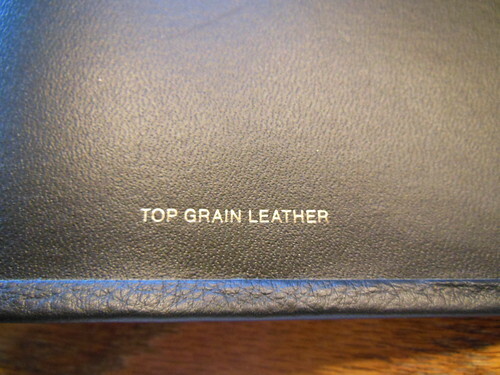 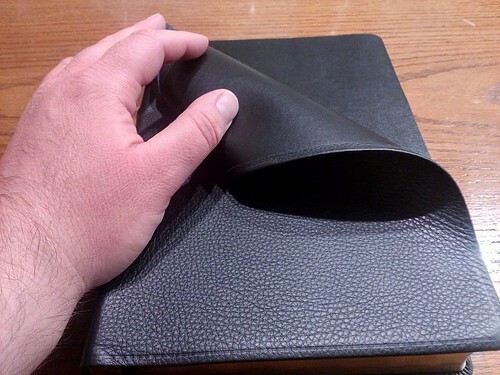 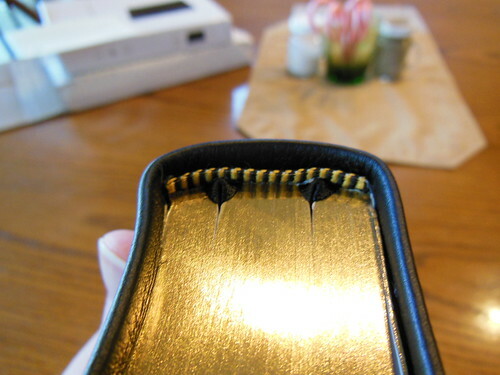 If I can afford them, I purchase ones that are edge lined and covered in goatskin leather. 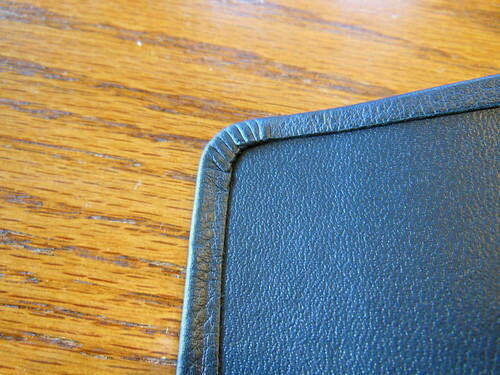 This synthetic cover was not bad. 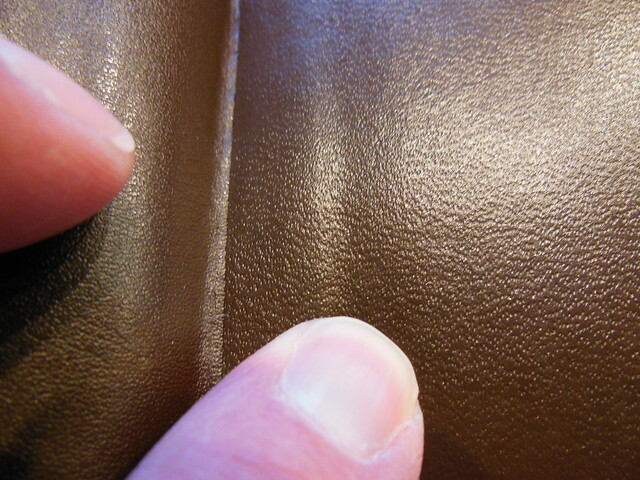 It was soft and flexible. 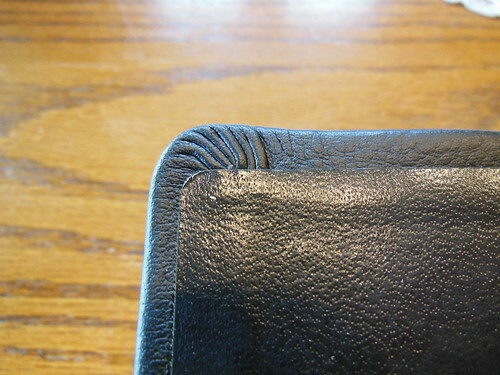 I did get a crease in it by folding it over. 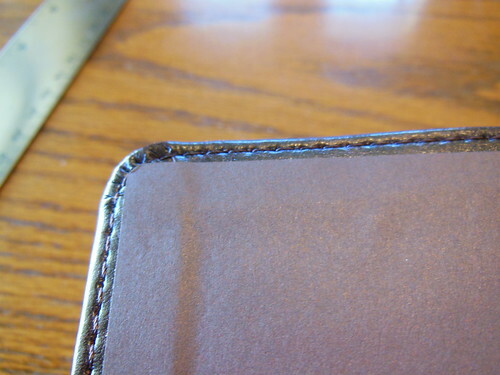 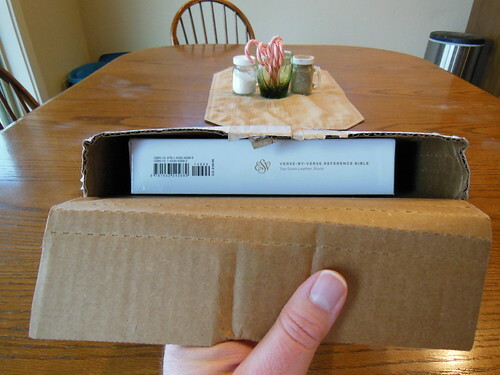 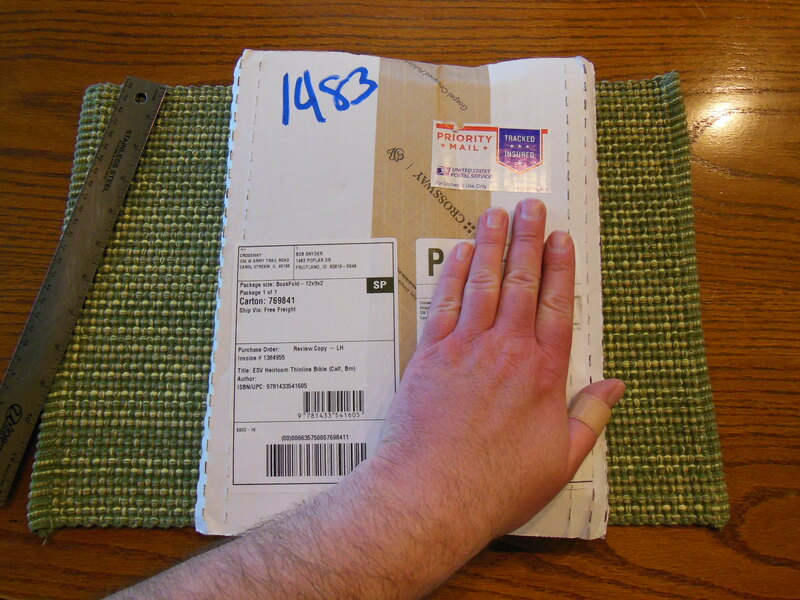 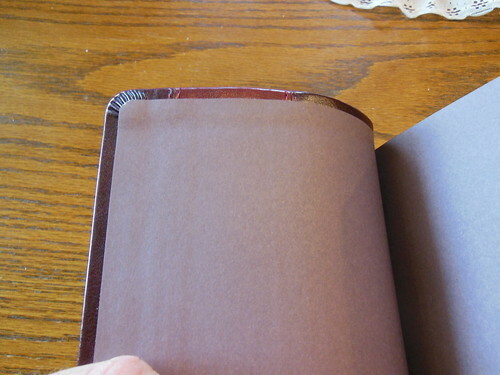 Once you get the paper liner creased it shows through the cover. 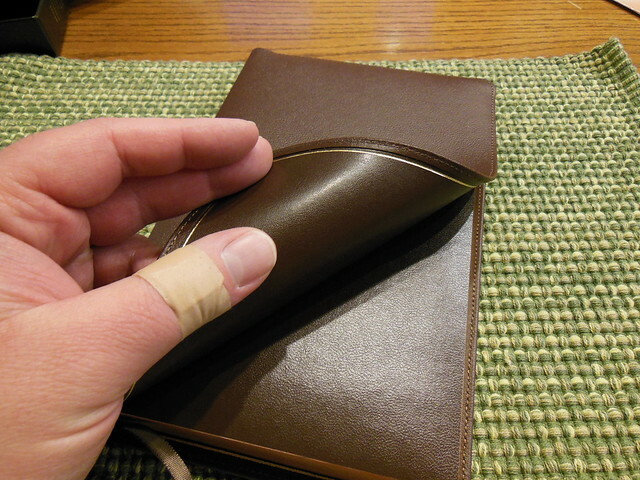 I don’t know how durable it will be. 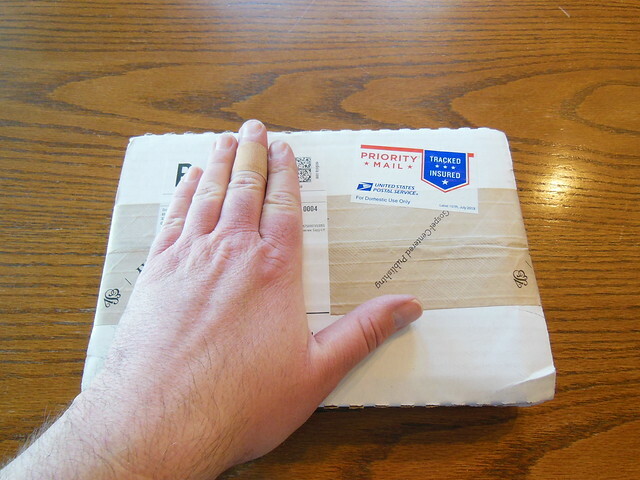 I’ll get back to you on that on in a couple of years. 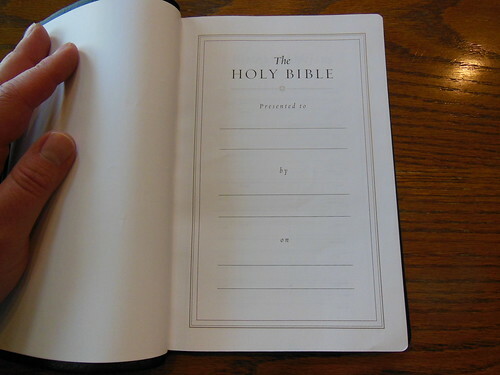 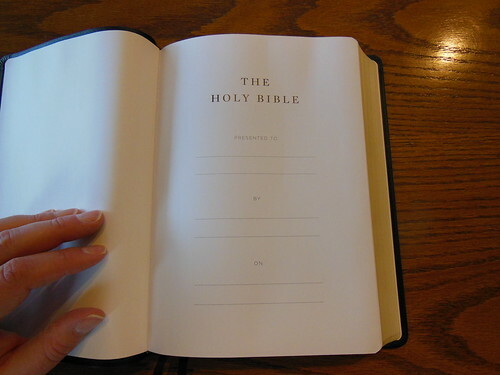 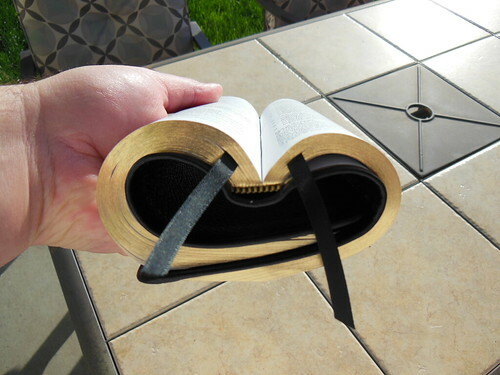 There is a good lifetime warranty on these Bibles. 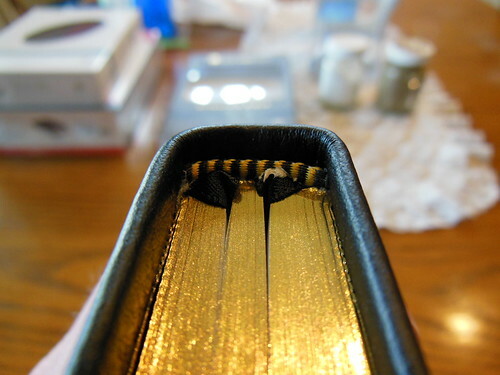 I’m not worried about service should anything go wrong. 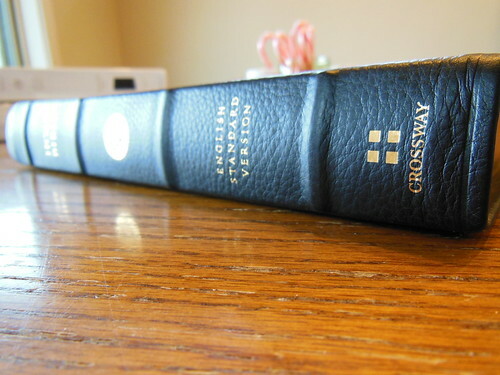 One of the major qualities that I love about Crossway Bibles, is even their value Bibles use better paper than almost all of their competitors. 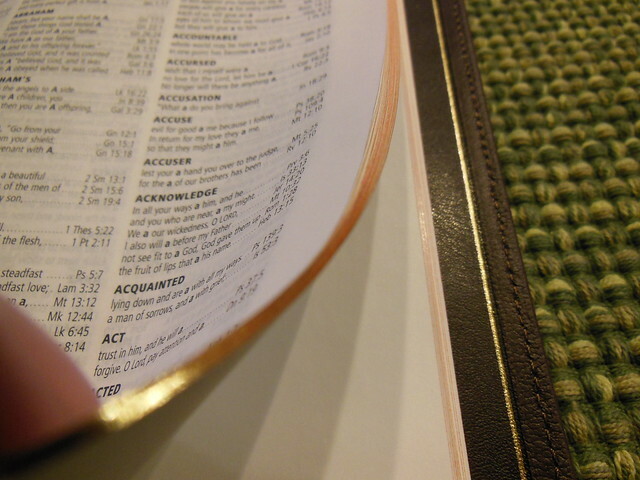 The paper in this thing is as good as some of the paper in the cost prohibitive premium Bibles. 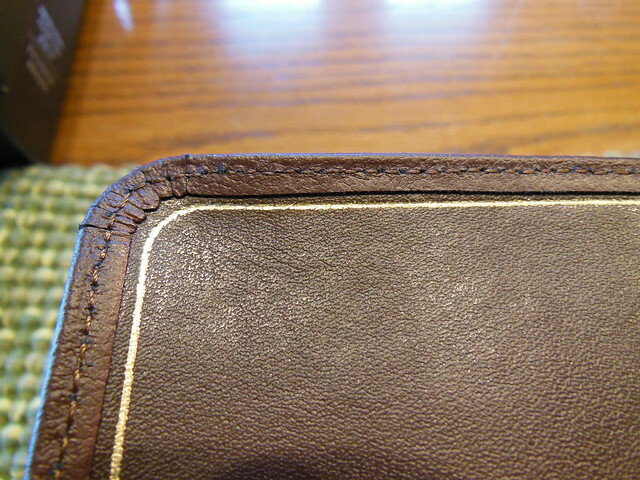 It is very opaque and seems pretty heavy. 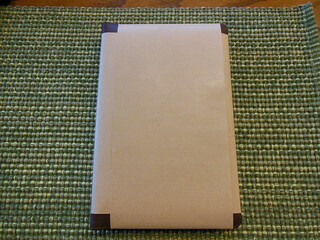 The old edition was printed on 24 pound (36 g.s.m.) 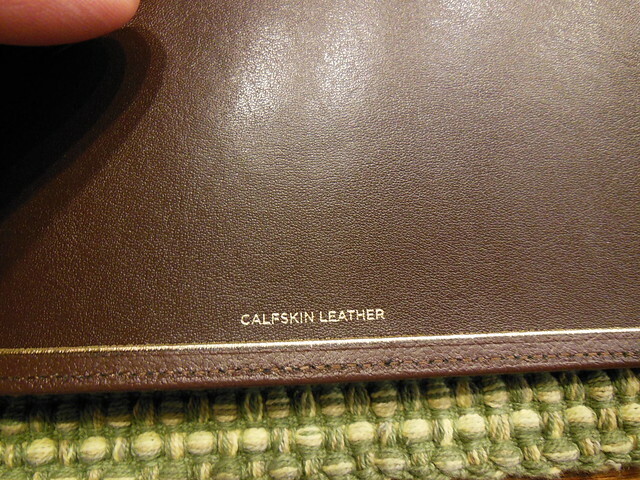 Thincoat™. 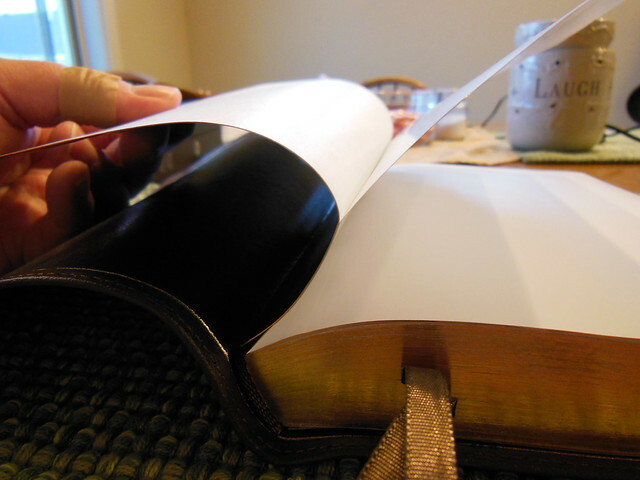 The paper in the new edition is uncoated. 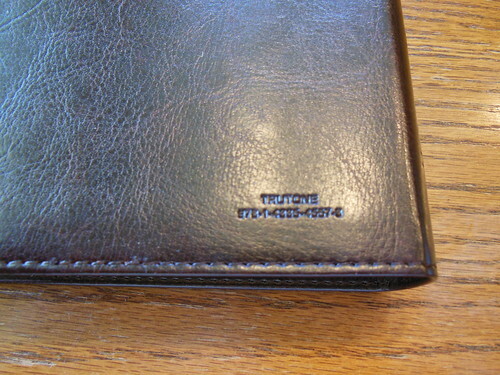 It remains the same weight. 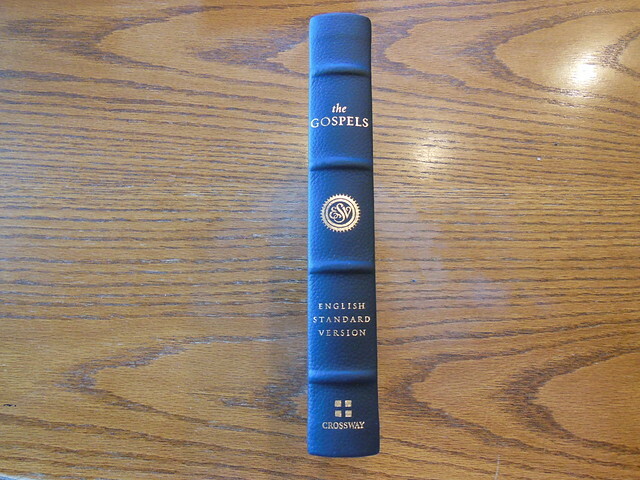 It is whiter than the earlier edition which in comparison seems a little more off white. 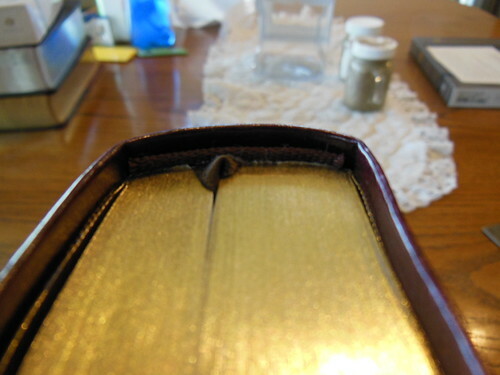 It could be that since I’ve had the other Bible for a few years the paper has yellowed a bit, but I doubt it. 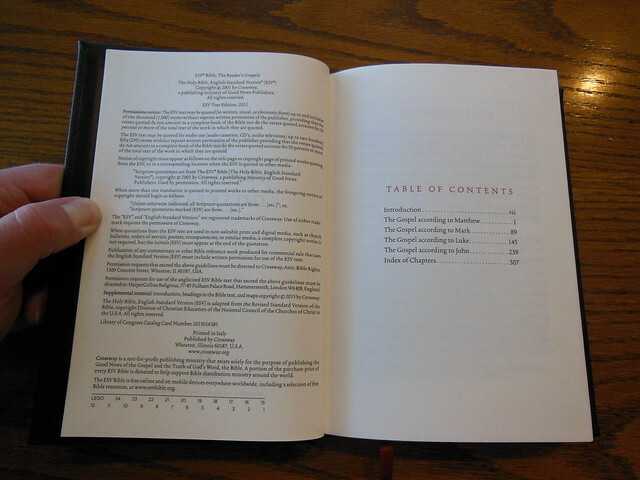 It is more likely that the coated paper of the earlier edition was responsible for the slight color difference. 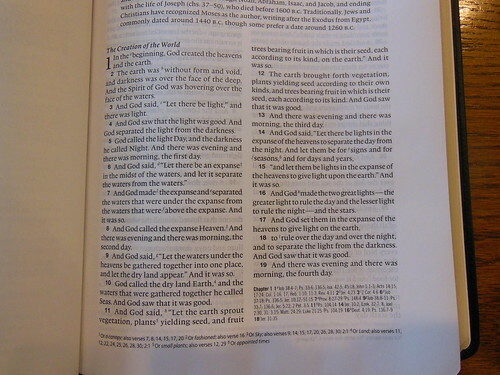 Here is a look at the previous edition. 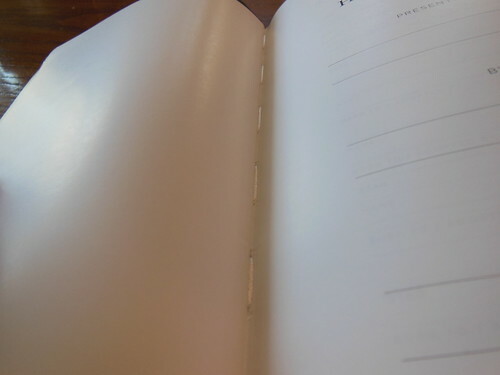 There is a slight tradeoff when using a heavier paper. 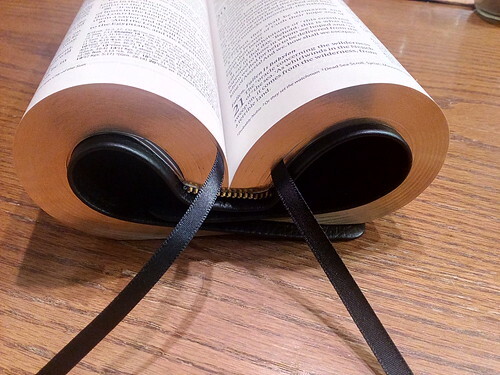 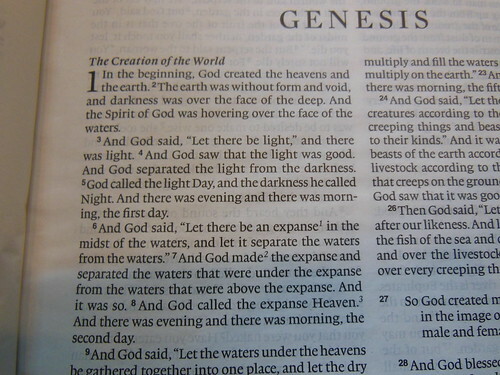 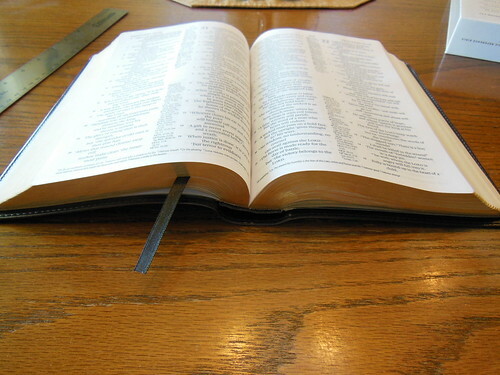 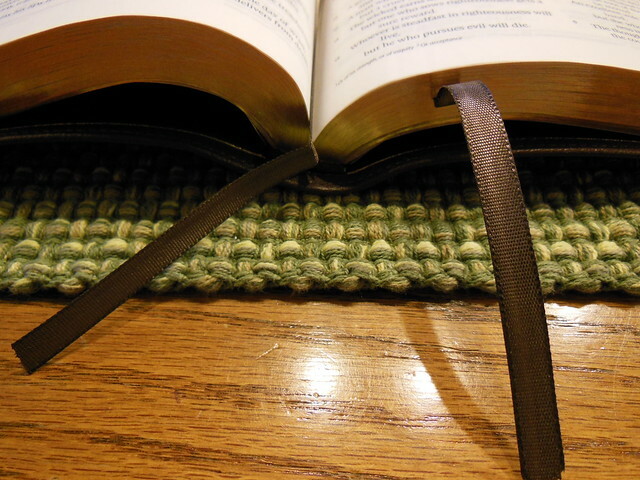 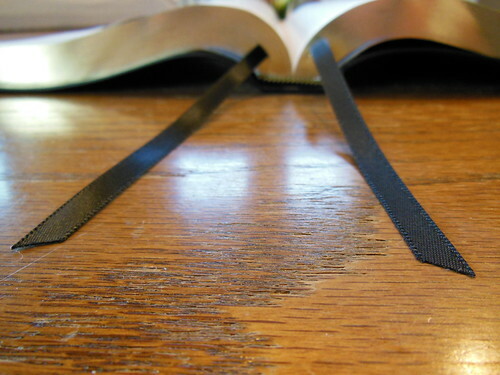 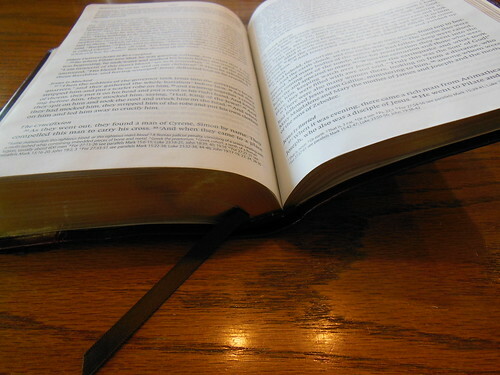 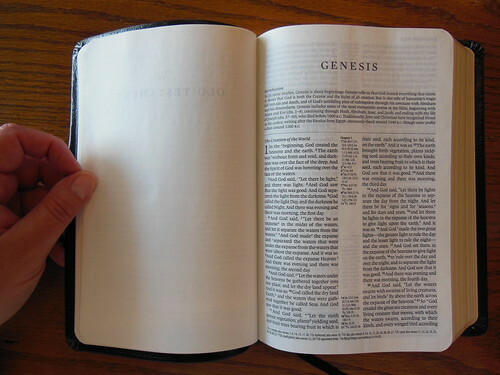 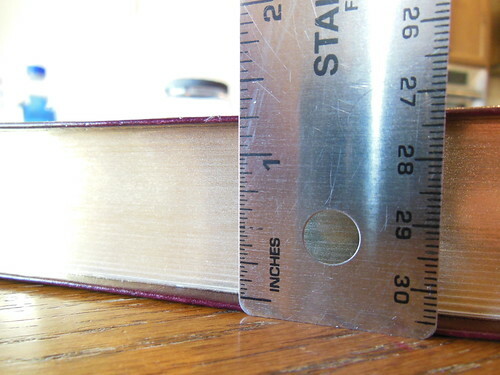 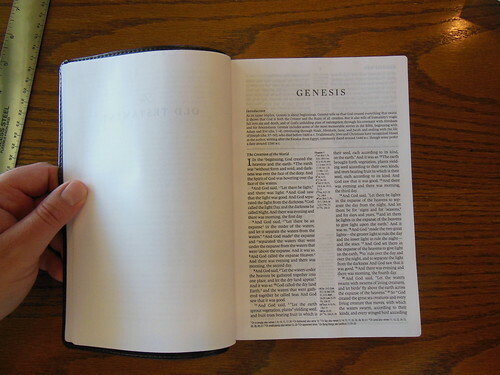 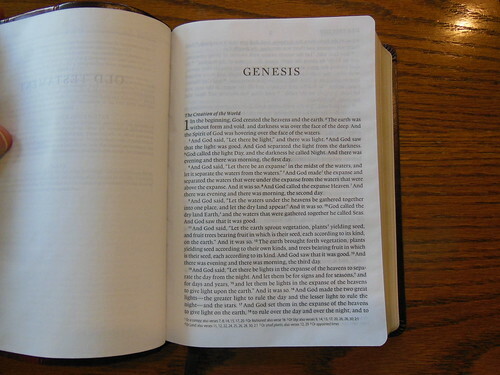 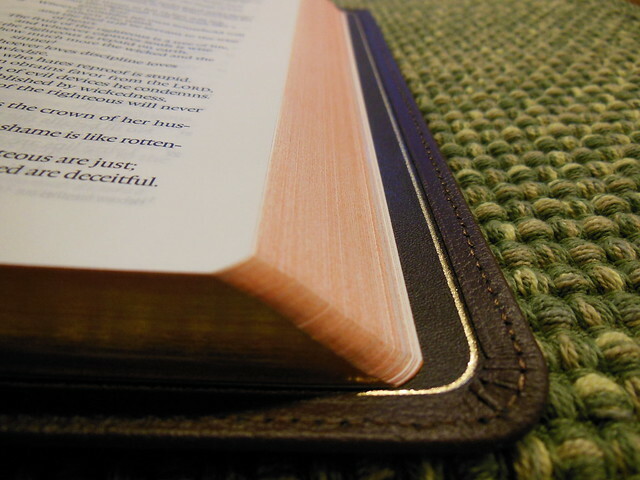 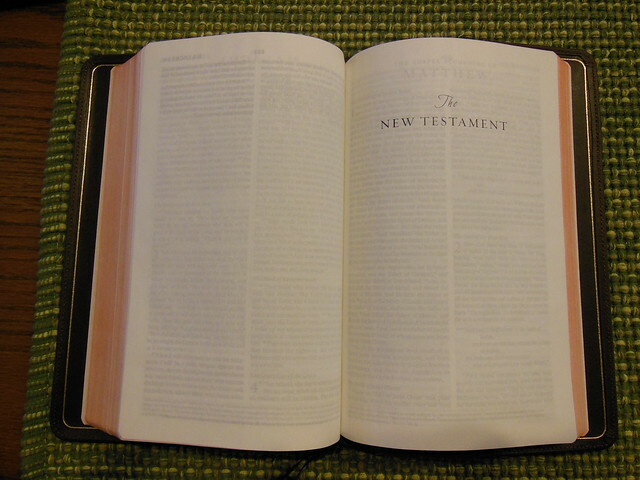 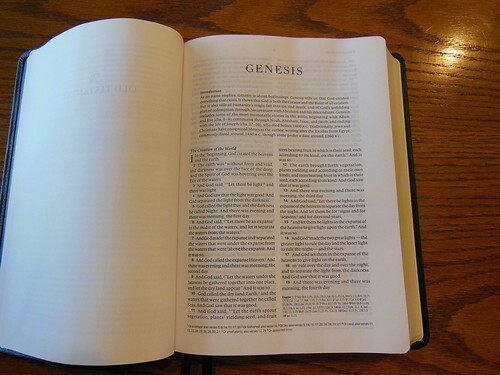 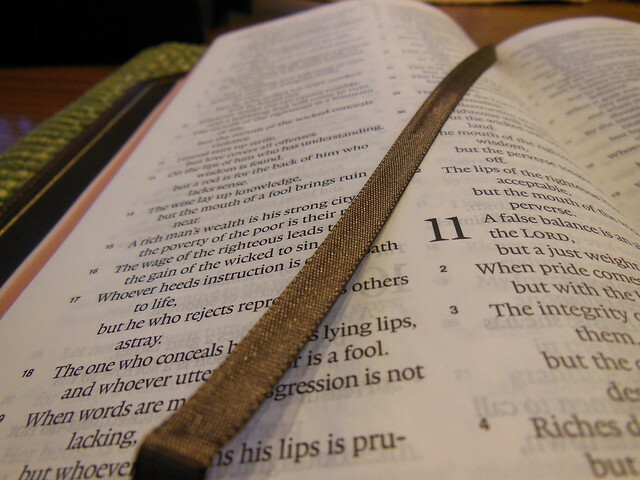 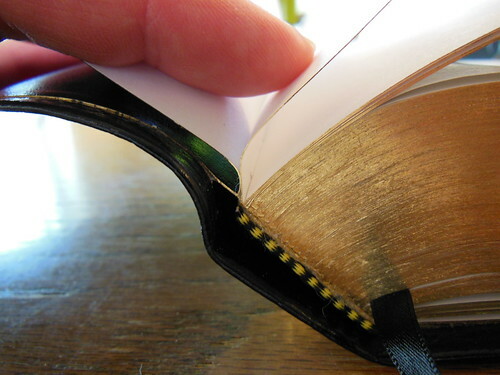 The Bible, by necessity of finites becomes thicker. 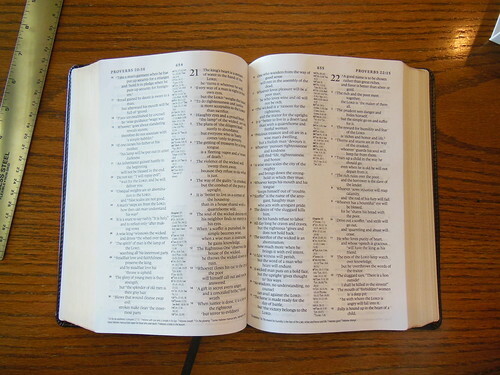 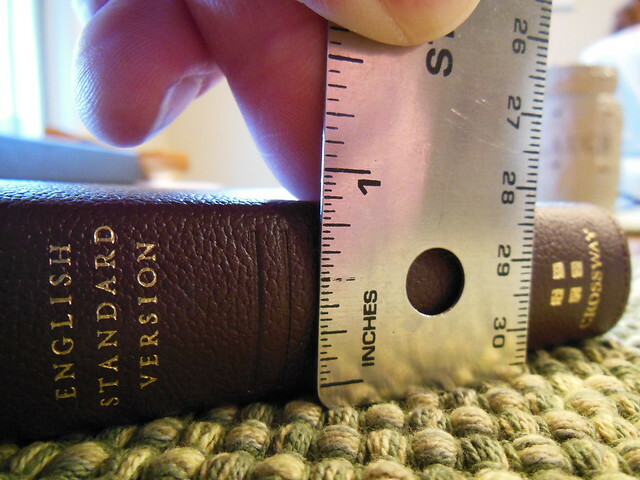 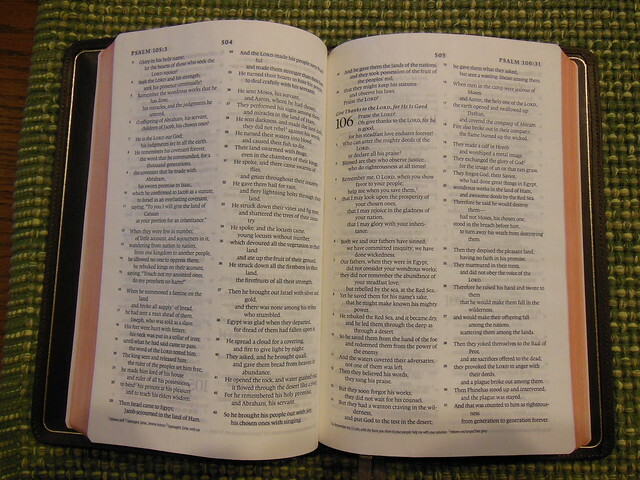 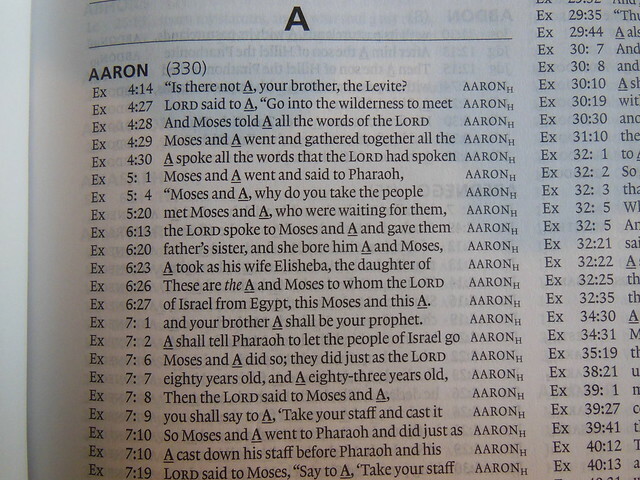 That being said, I would much rather a Bible be thicker and very legible than be thinner and barely legible. 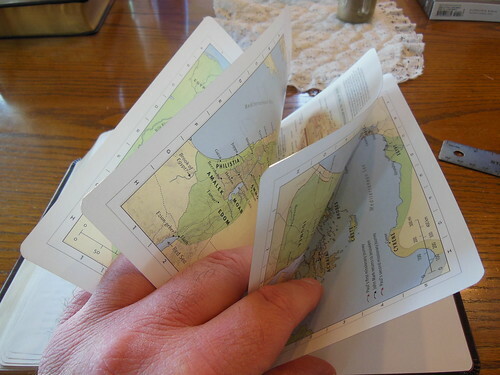 Ghosting is a real problem on thinner paper and can make daily reading a near impossible task. 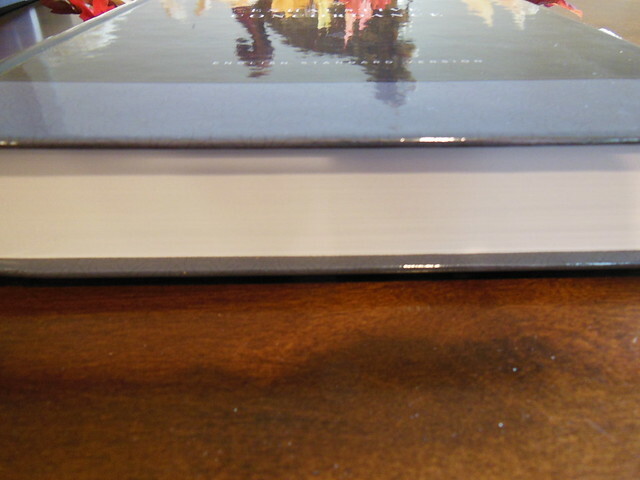 The New Classic Reference is not too heavy or big. 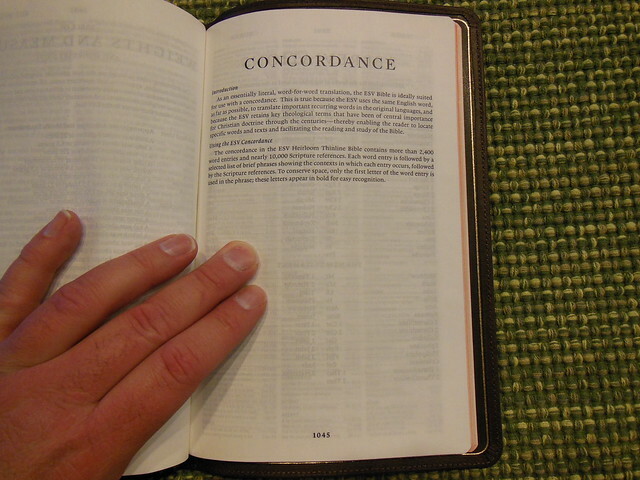 It feels good to hold and read from. 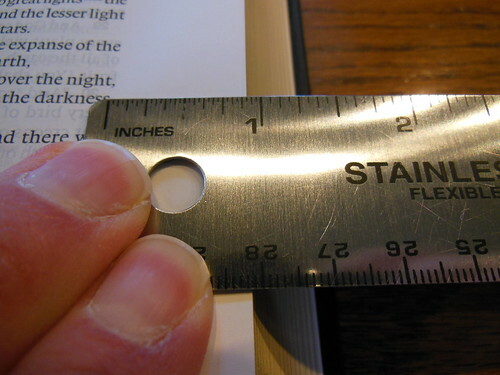 The fact that it is a tad bit thicker doesn’t make it uncomfortable to use. 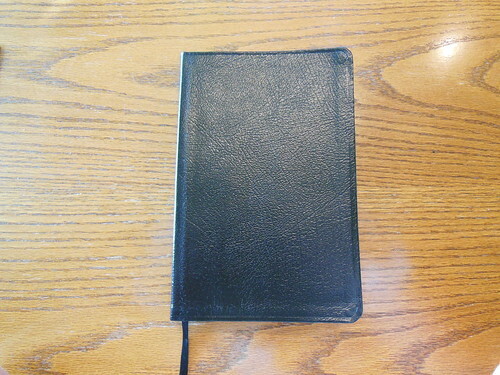 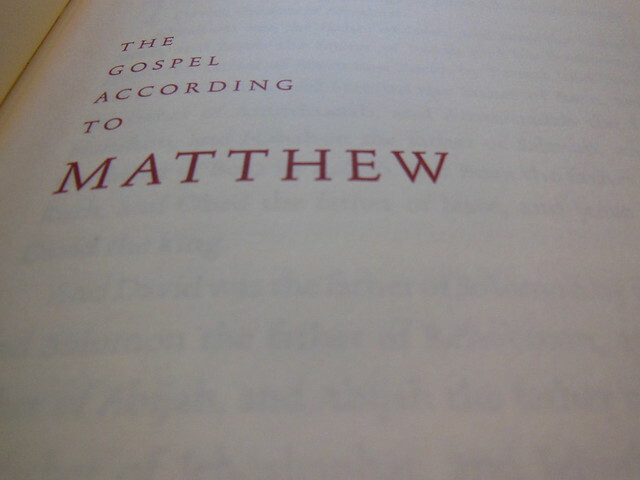 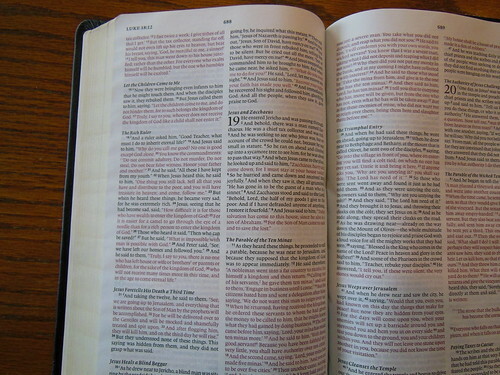 I find it to be subjectively, one of the most comfortable Bibles I’ve spent hours reading from. 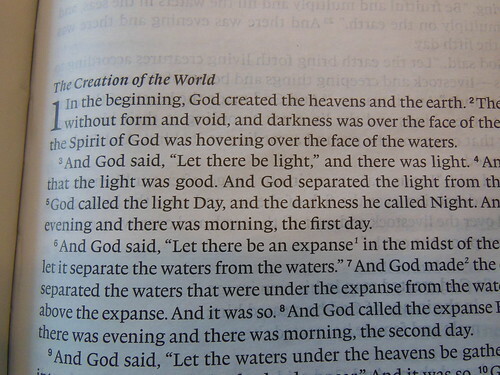 Both the older edition and the new one, offer good contrast between the paper and the text. 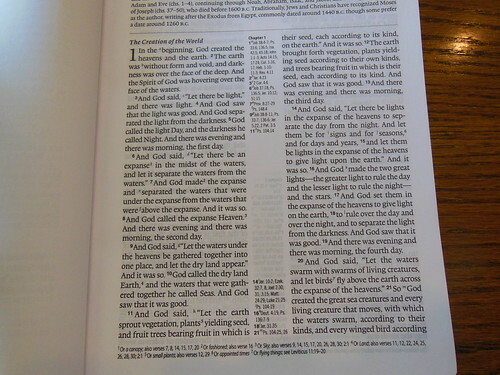 The text is a modern setting of Lexicon font in 9 pt size. 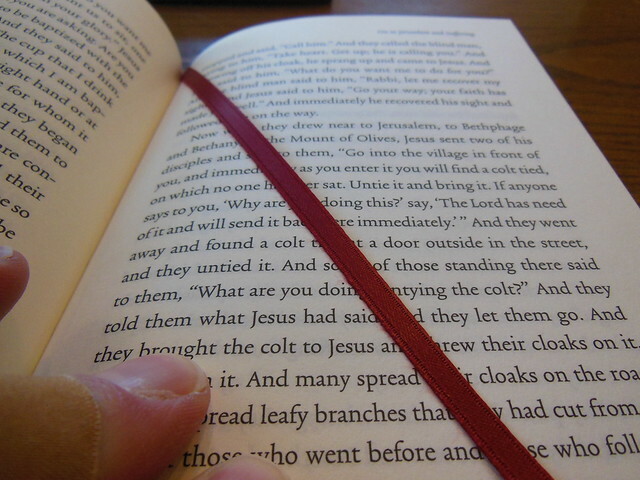 It is sharp and crisp against the backdrop of the page. 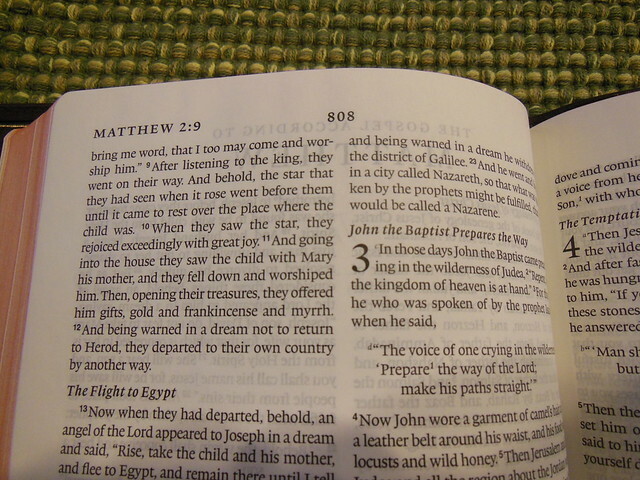 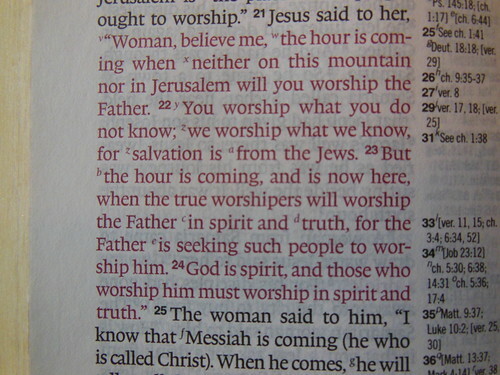 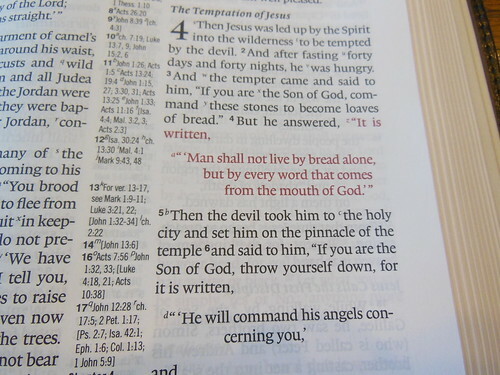 This is a red letter edition with the words of Christ printed in red. 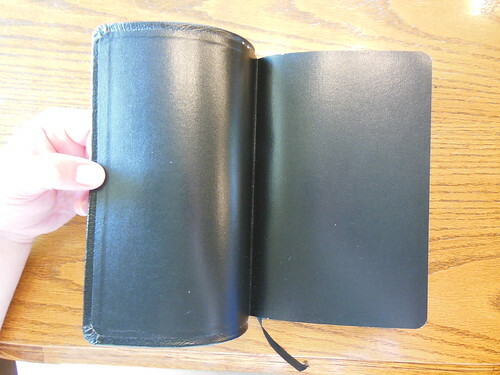 Some people like this feature and others think it detracts from the entirety of the word being inspired. 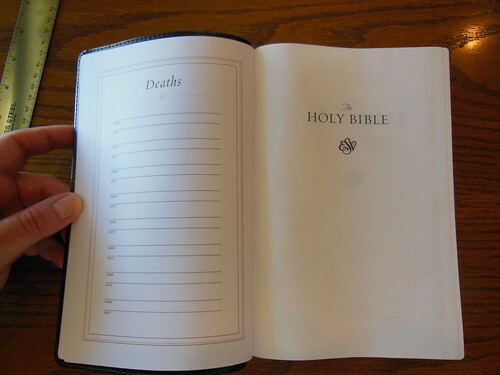 I don’t have an opinion either way. 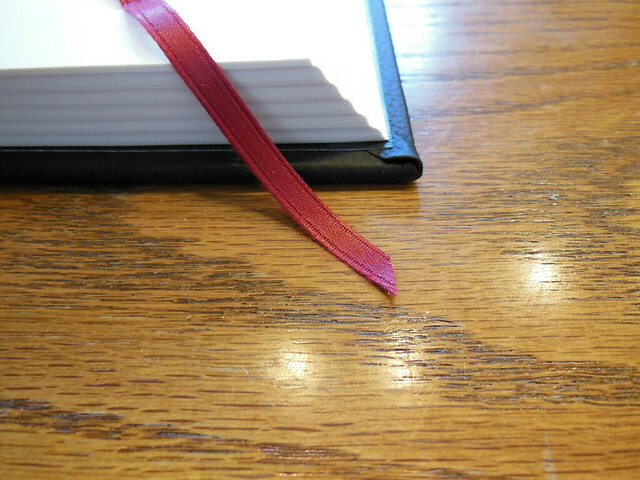 If it is done well, I like it. 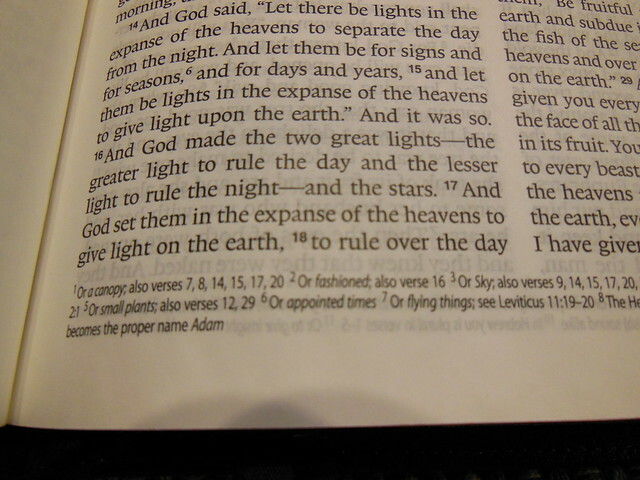 The red and black ink is consistent throughout. 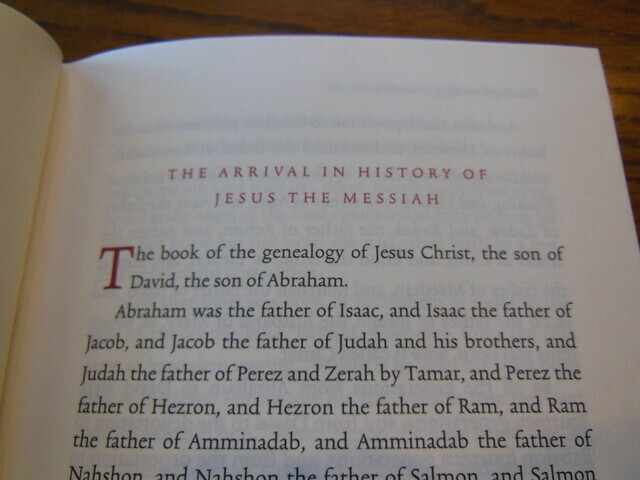 There are book introductions at the beginning of each book. 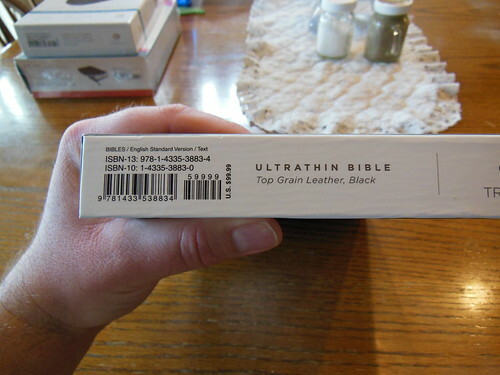 This is pretty helpful without adding the bulk that a study Bible would have. 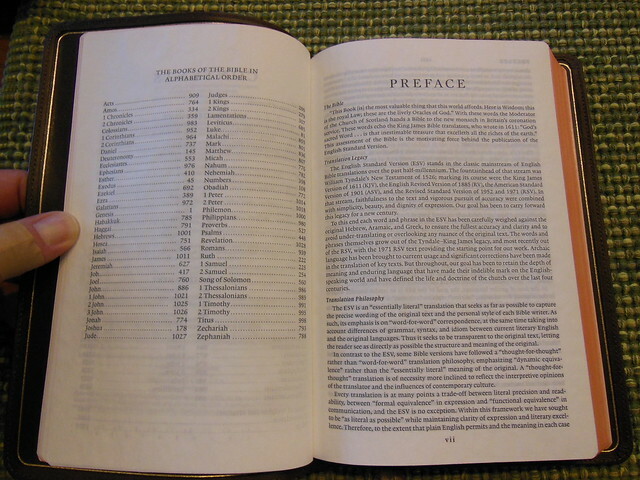 The New Classic Reference is laid out in a double column, paragraph format, with center column references. 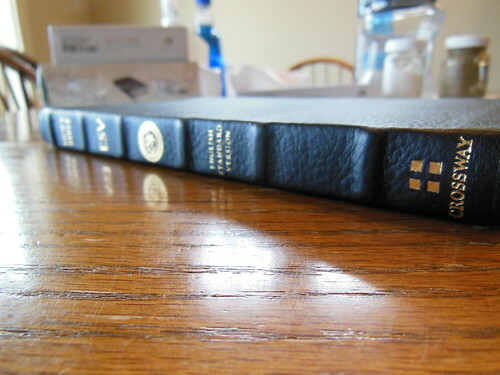 This is pretty standard, but again due to the paper quality, uniform printing, and smyth-sewn binding this Bible stands out. 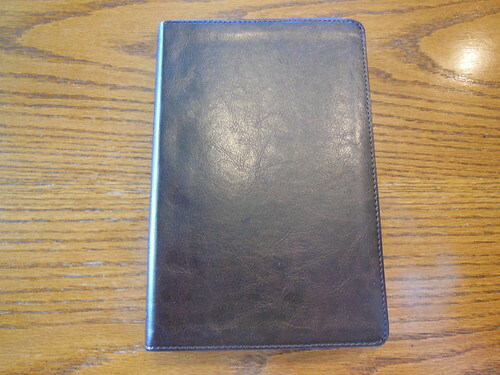 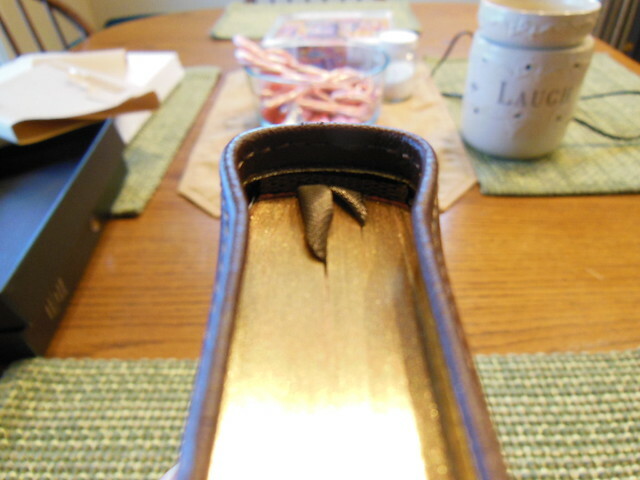 I am thinking about rebinding it in goatskin leather. 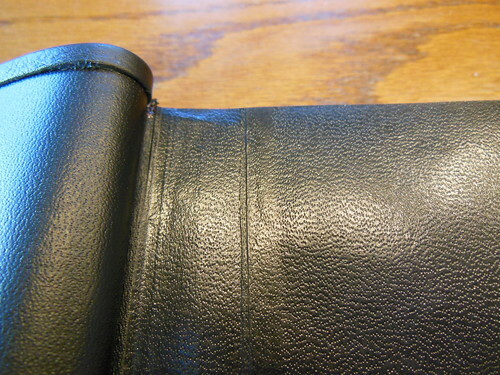 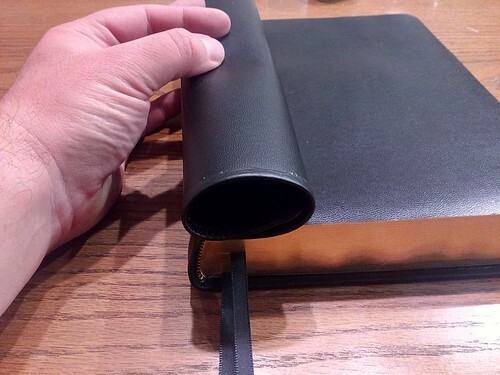 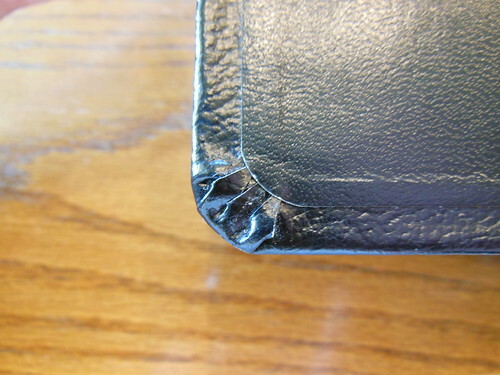 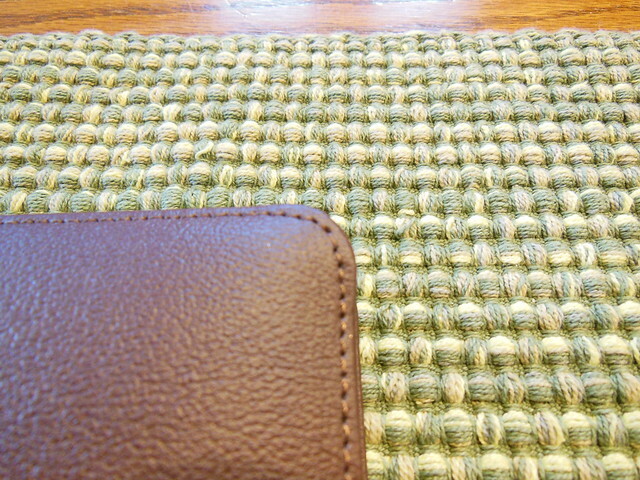 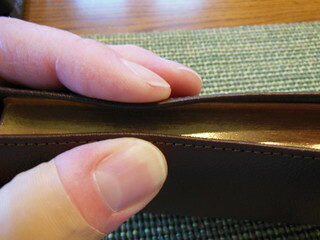 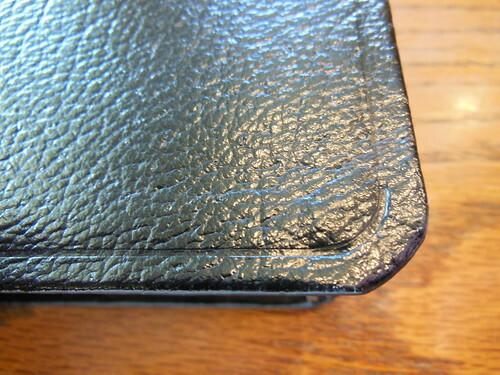 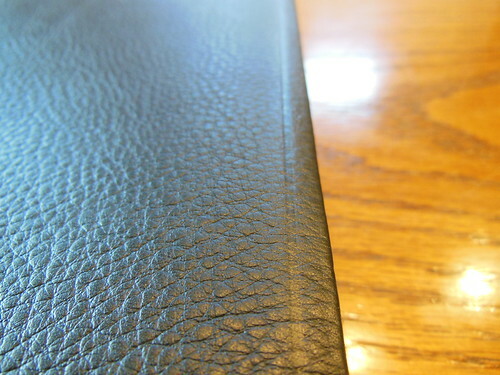 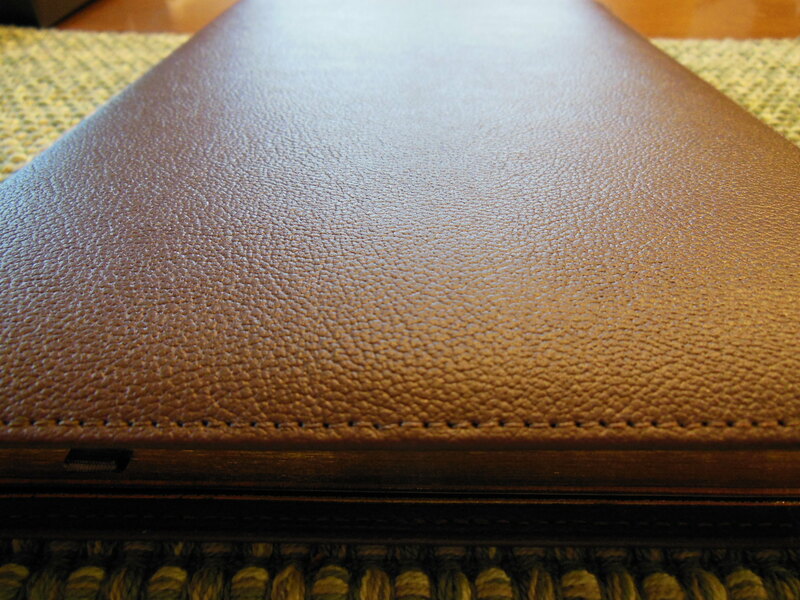 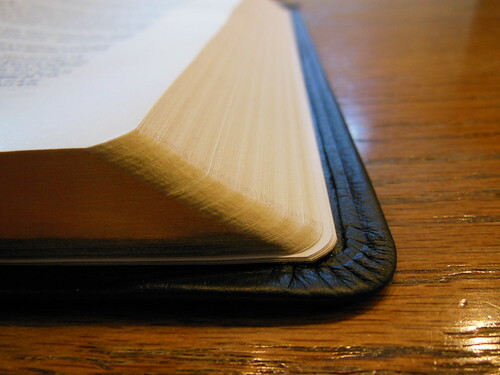 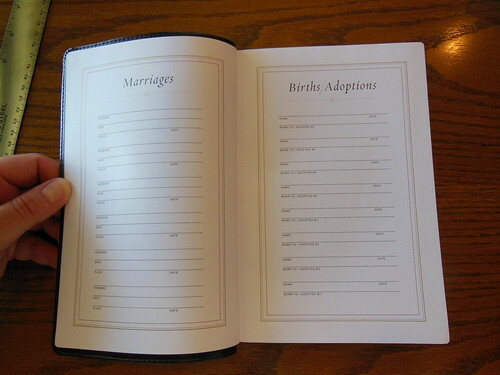 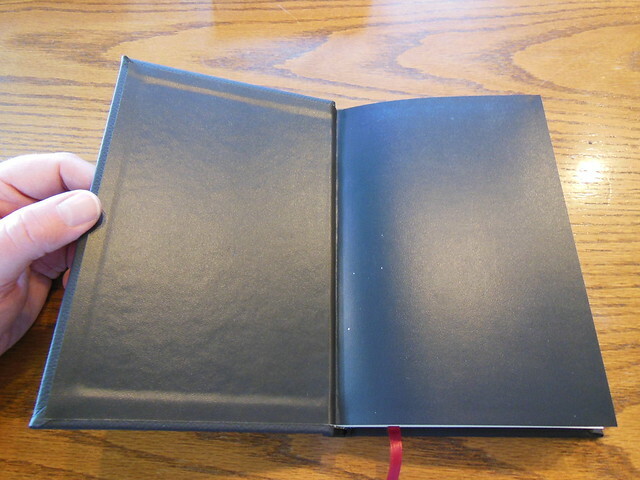 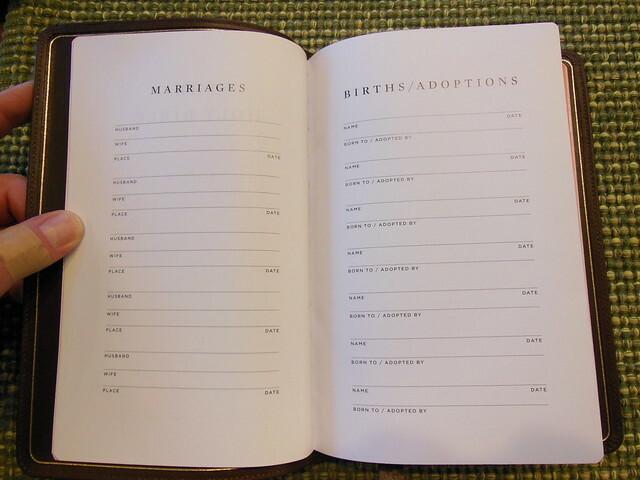 It is an excellent candidate for rebind because of the low initial purchase price, paper, print, and the sewn binding. 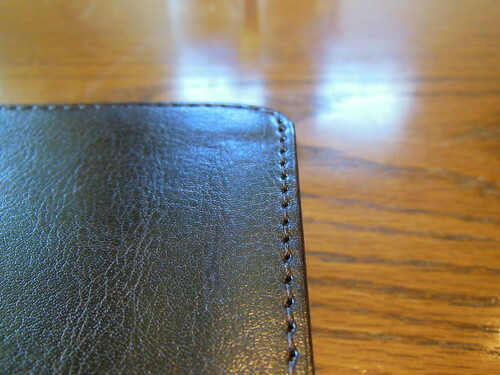 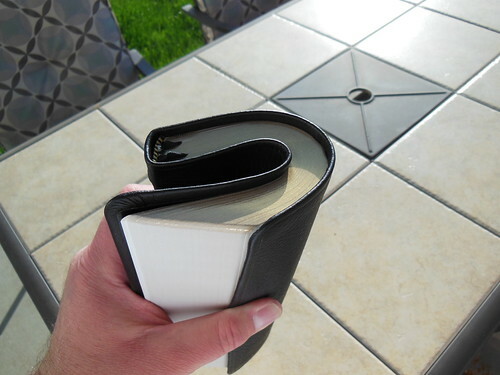 If you couldn’t tell by now, this does have a sewn binding making it flexible and durable. 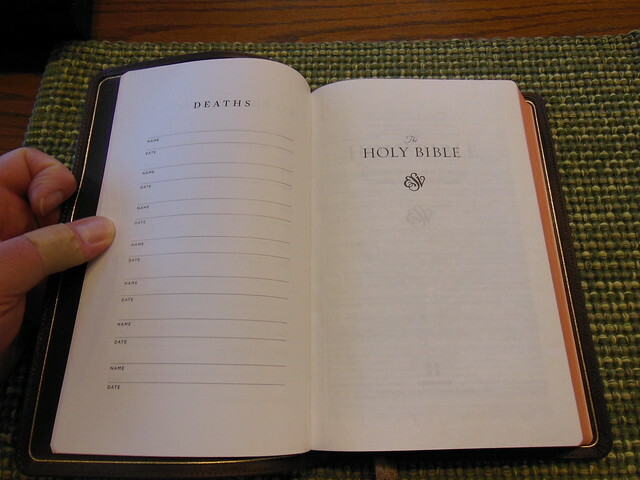 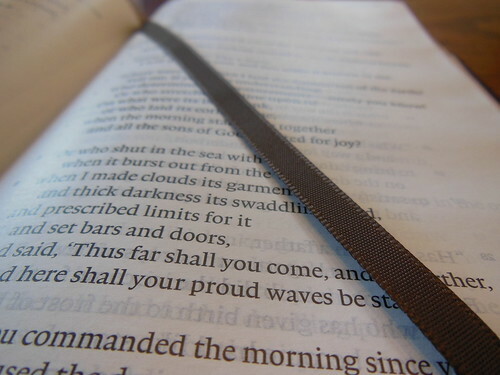 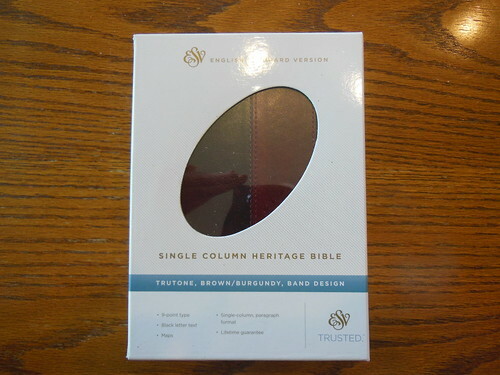 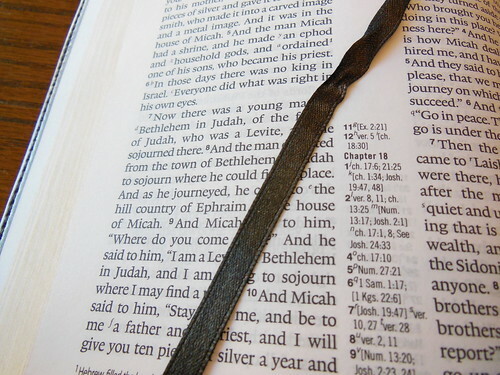 It has one ribbon marker that matches the color scheme of the Bible. 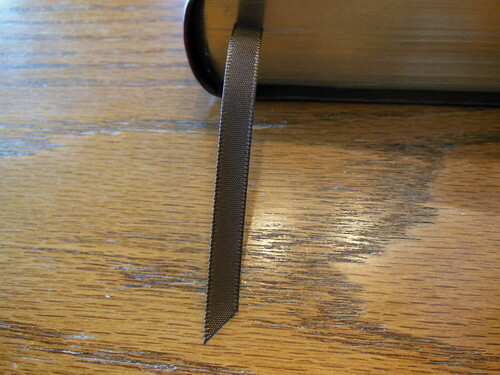 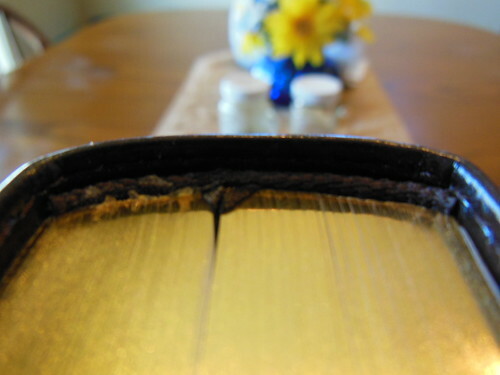 It is a pretty thin ribbon. 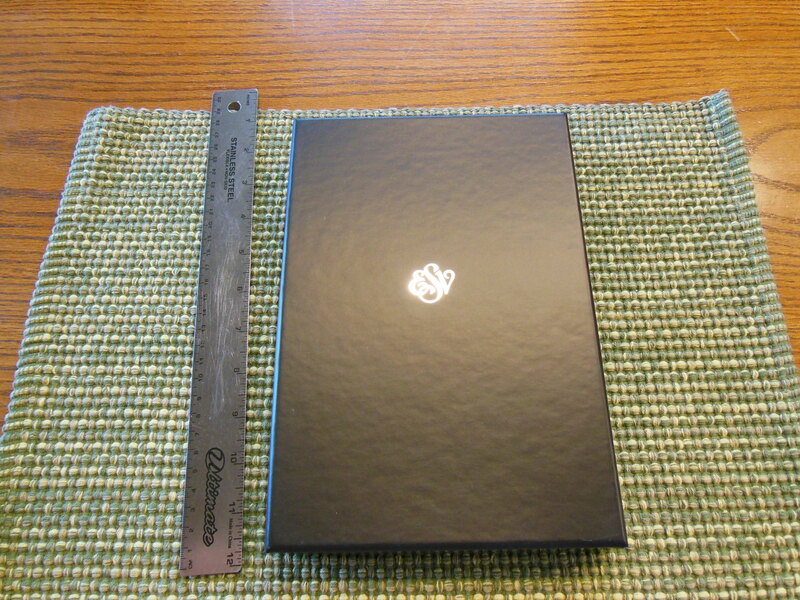 The spine has also been rounded. 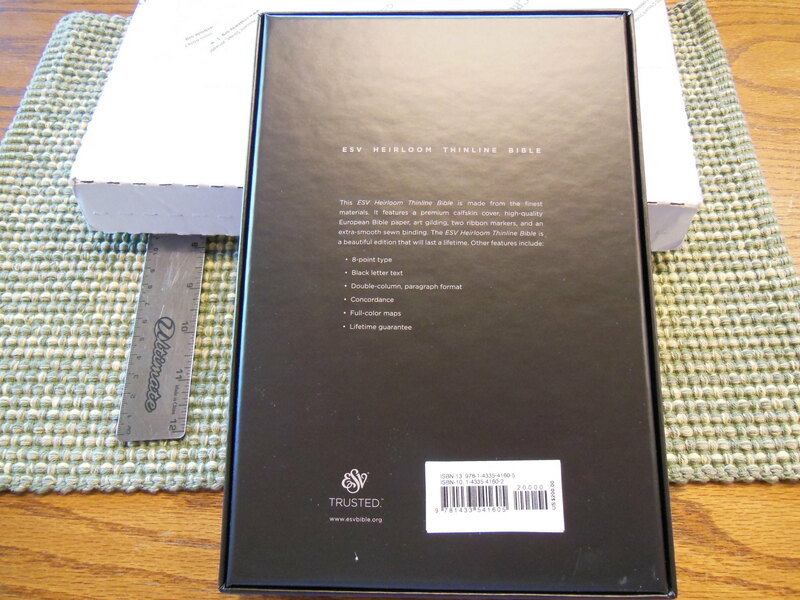 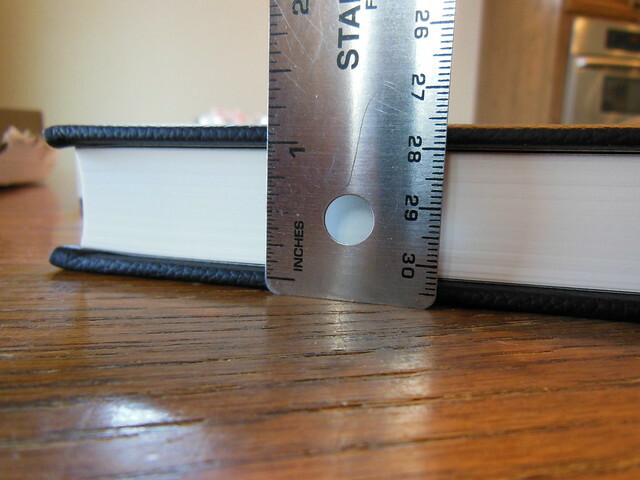 The older edition has a flatter spine that doesn’t appear rounded. 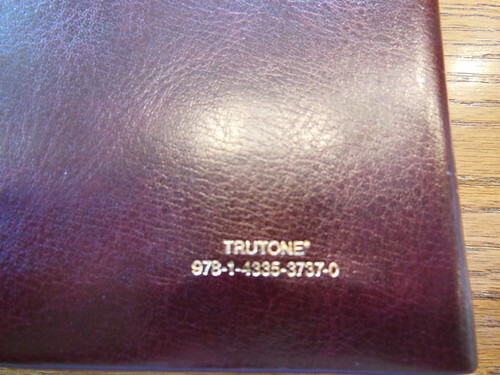 The older edition was manufactured in the United States, while this one was manufactured in China. 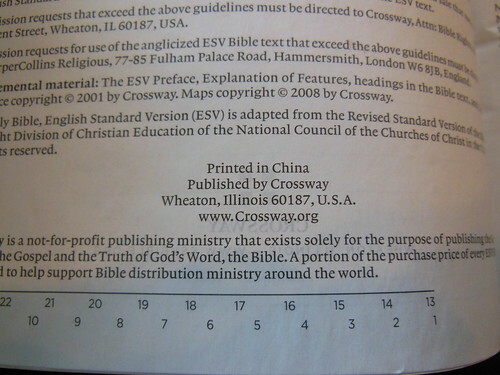 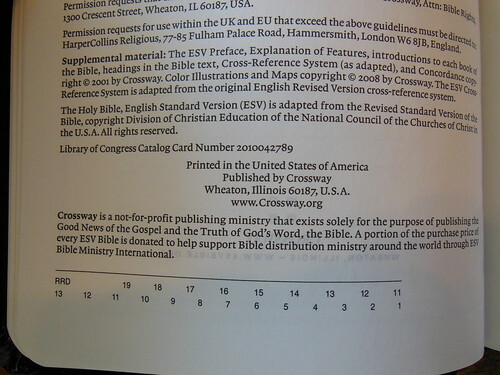 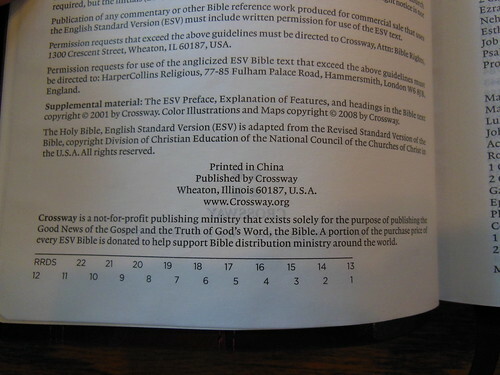 As long as Crossway can ensure quality control, this shouldn’t be a problem. 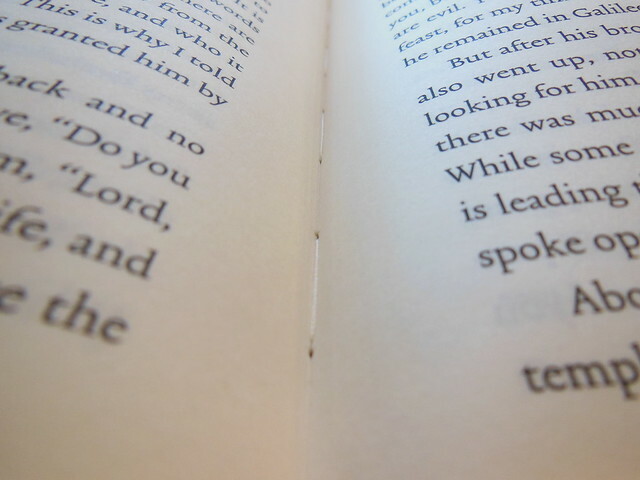 Other publishers have not been able to, and have suffered the consequential negative effects to their reputations. 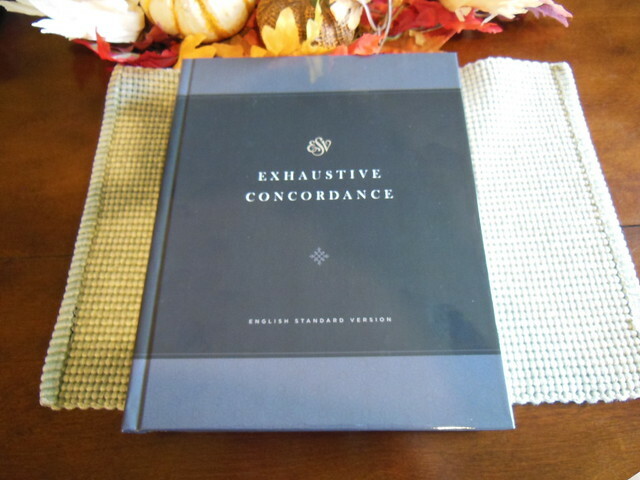 An excellent three column concordance is included in the back with 32, color maps and illustrations. 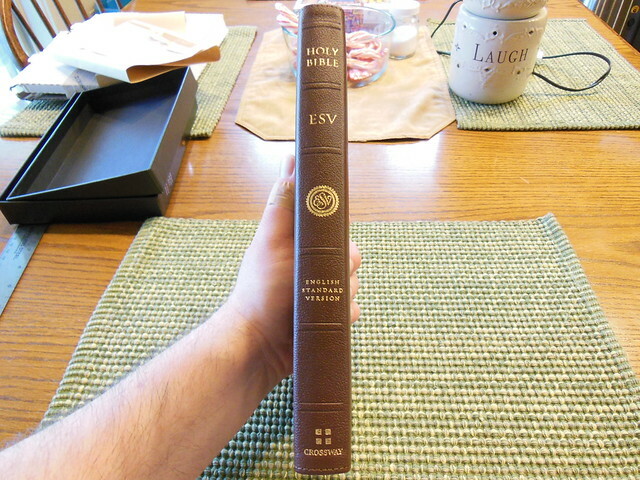 The overall impression I got was that this is still the same reference Bible that so many people have loved over the years with some small changes. 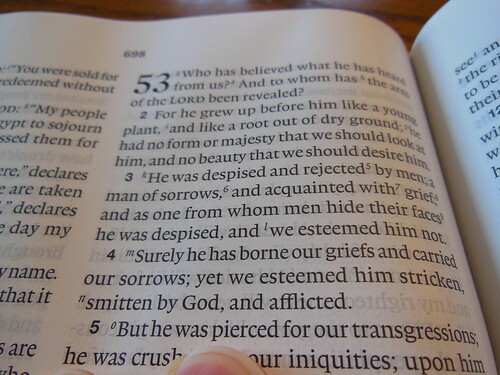 The most important qualities have not changed. 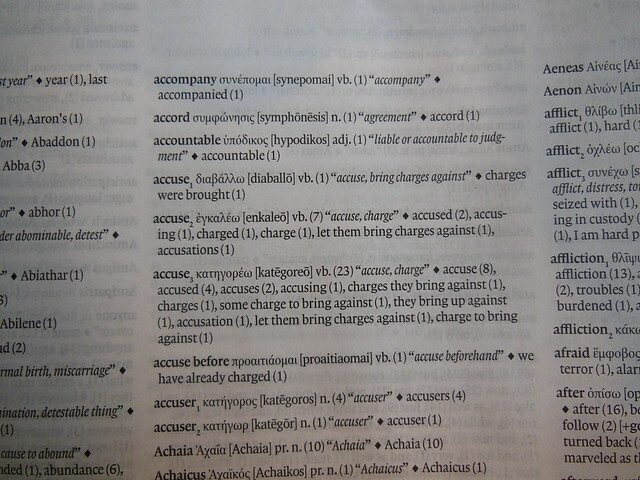 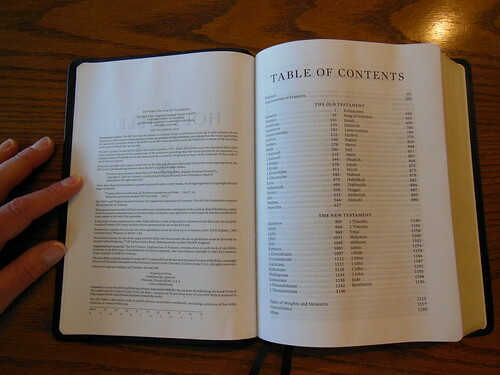 It remains very legible, and easy on the eyes for long bouts of reading. 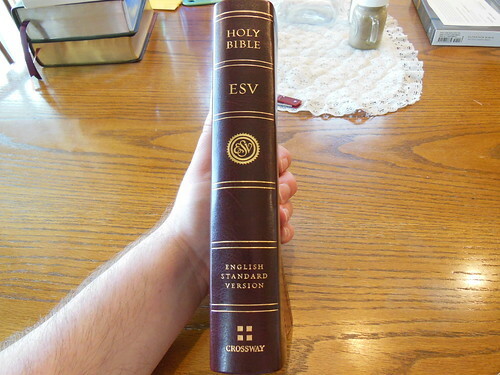 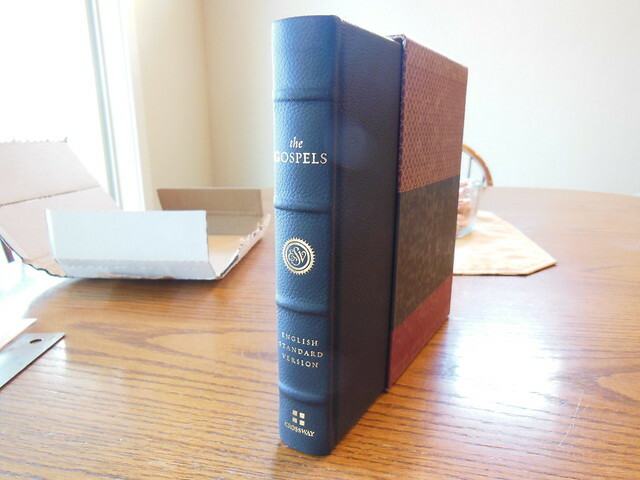 It wins, hands down over many other similarly priced Bibles due to the paper, print, and binding. 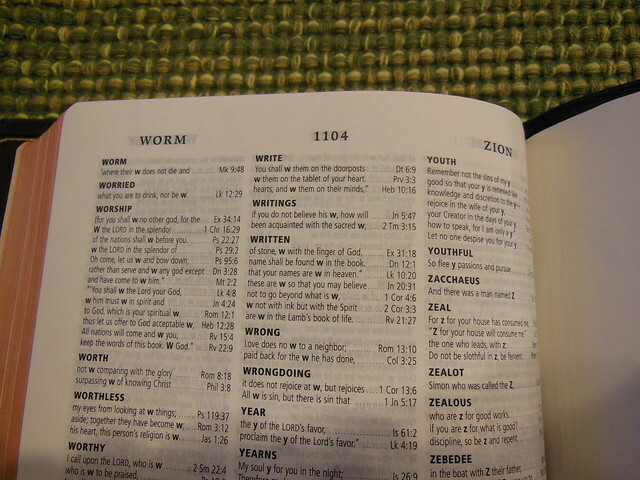 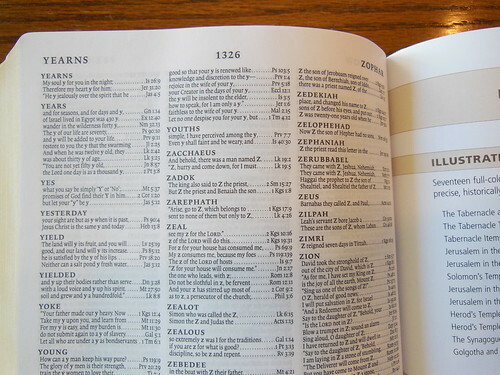 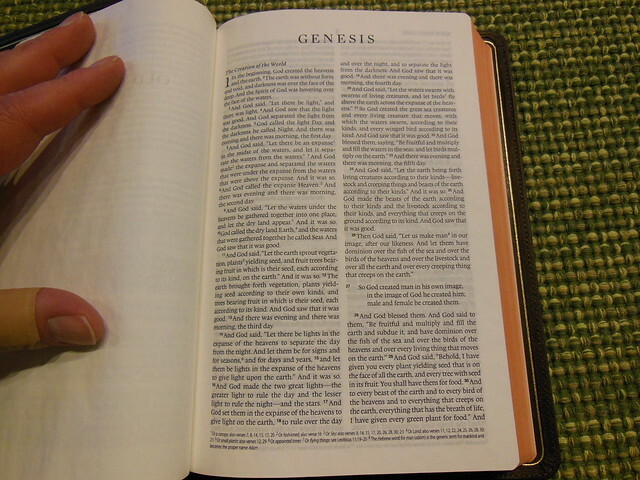 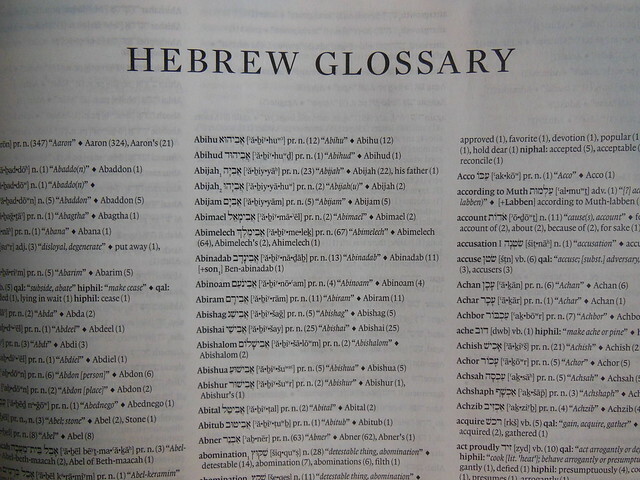 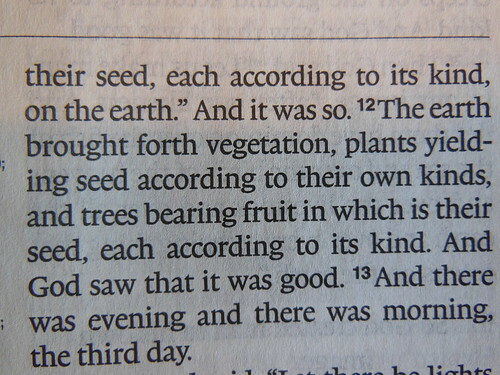 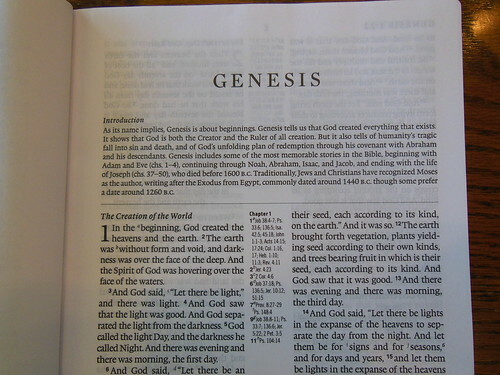 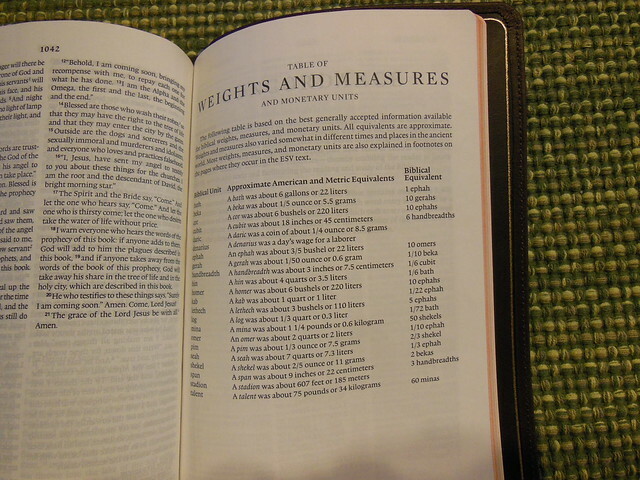 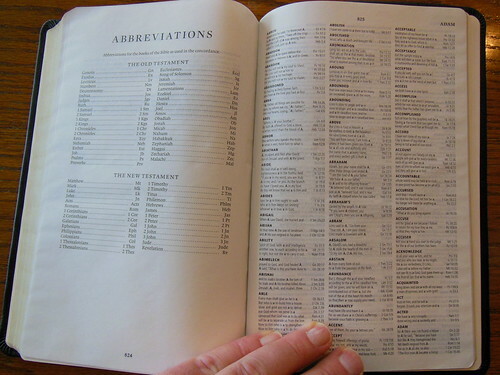 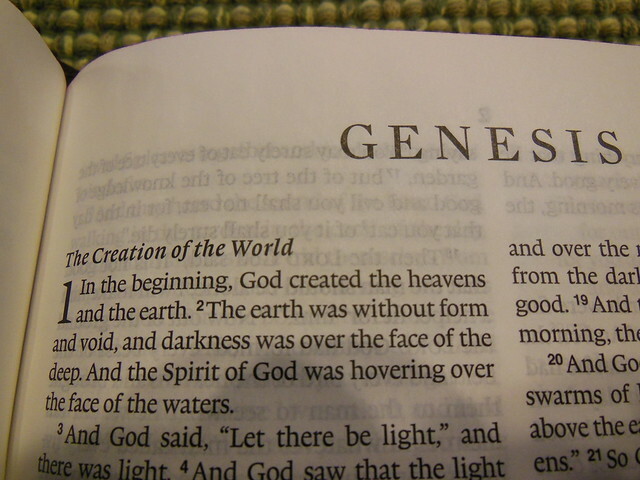 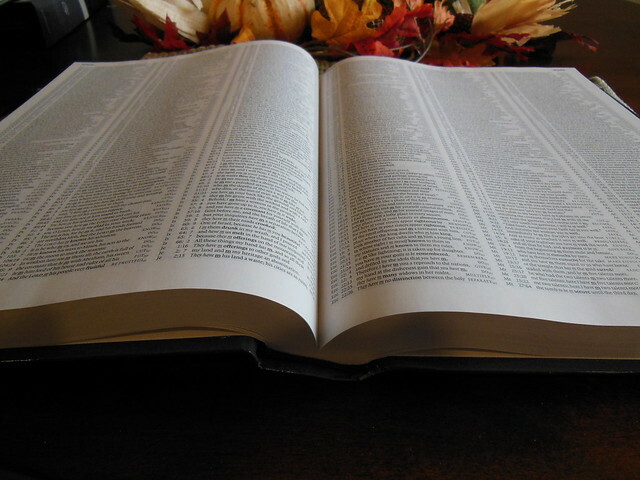 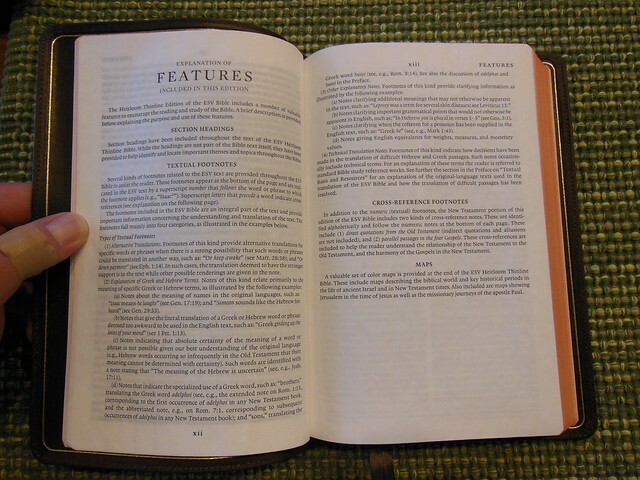 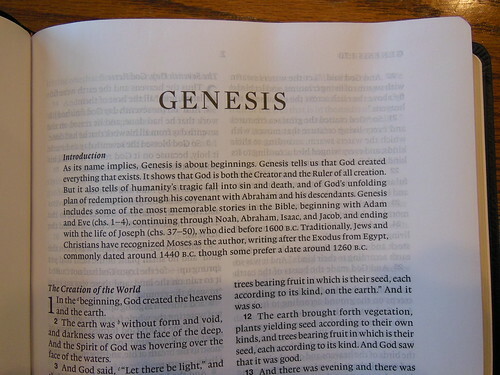 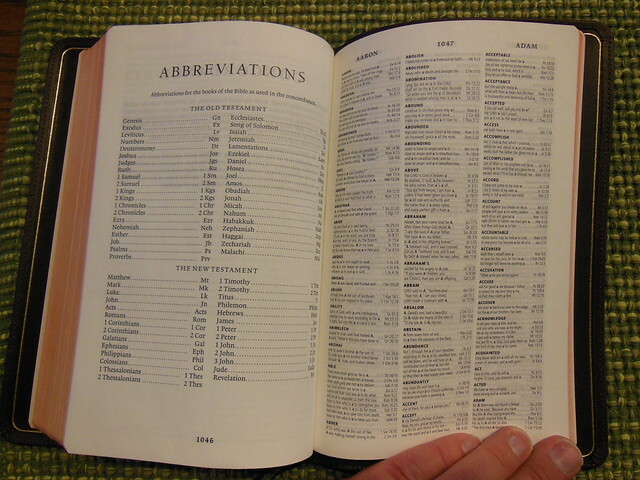 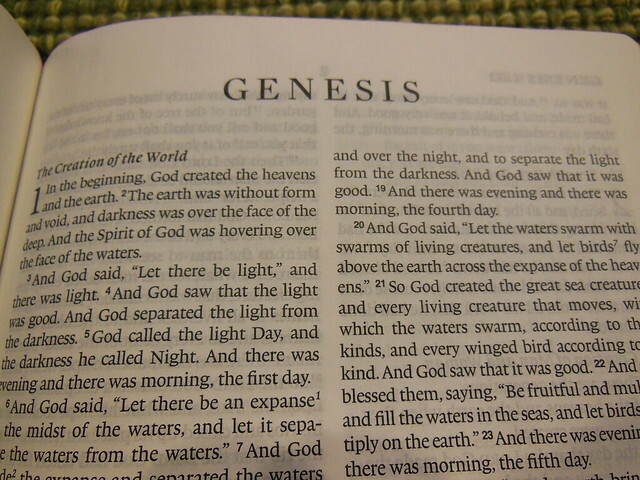 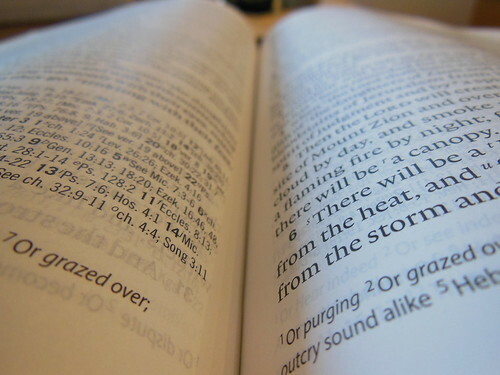 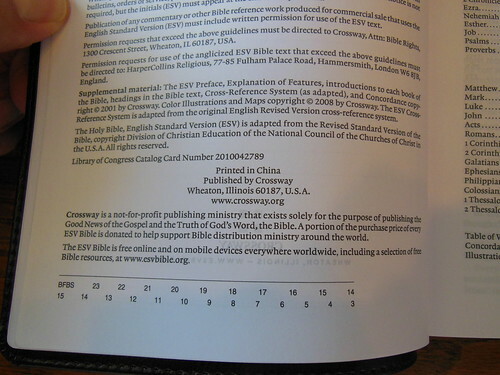 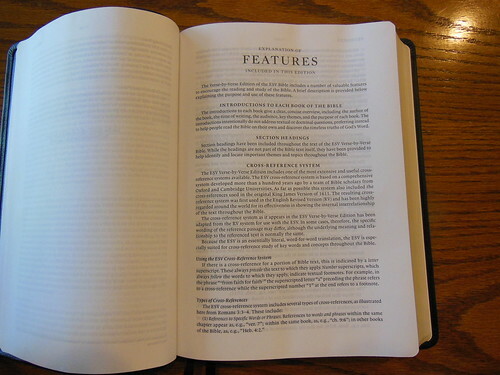 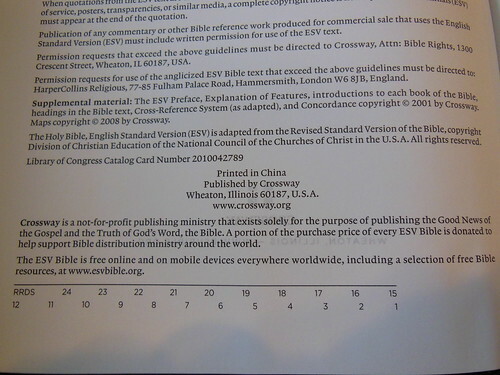 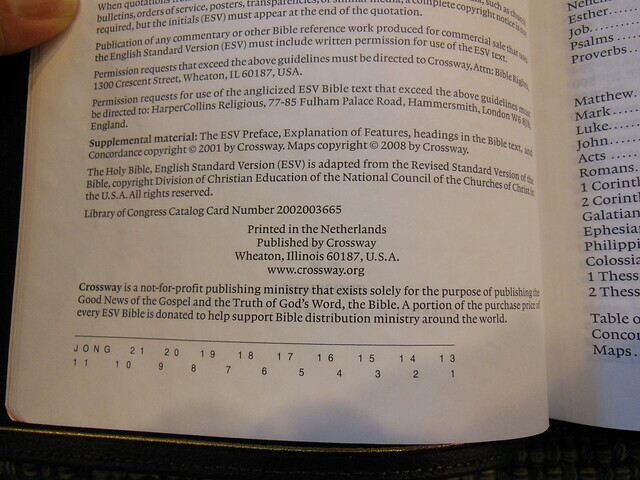 Throw in the formal equivalent English Standard Version (ESV) translation and you have a great reference Bible. 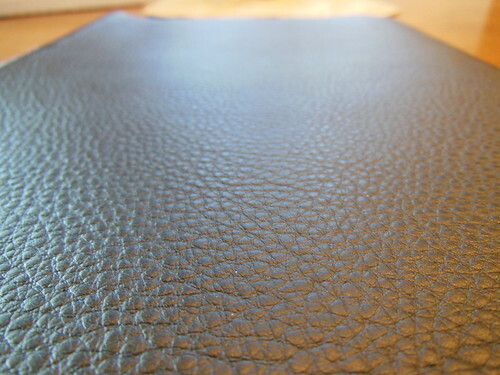 Make sure to check out all the pictures of the New Classic Reference here, and the old one here. 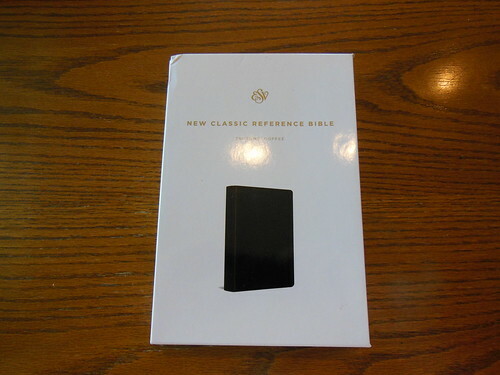 The ESV New Classic Reference Bible is a new edition of the first ESV Bible edition ever published in 2001—the ESV Classic Reference Bible. 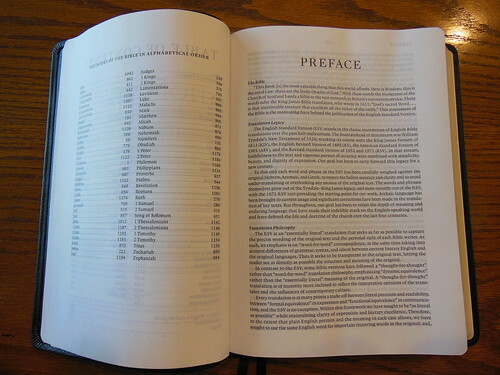 This practical and popular format combines the ESV text with a robust concordance and one of the most comprehensive and useful cross-reference systems available today—more than 80,000 references conveniently located in the center column on each page. 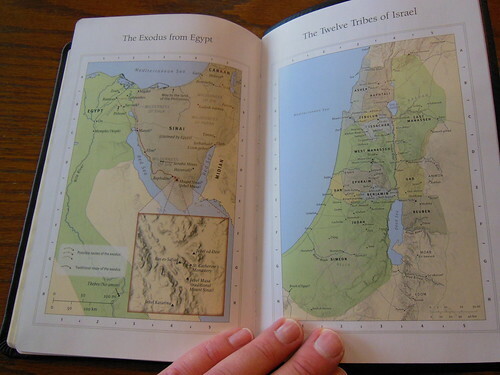 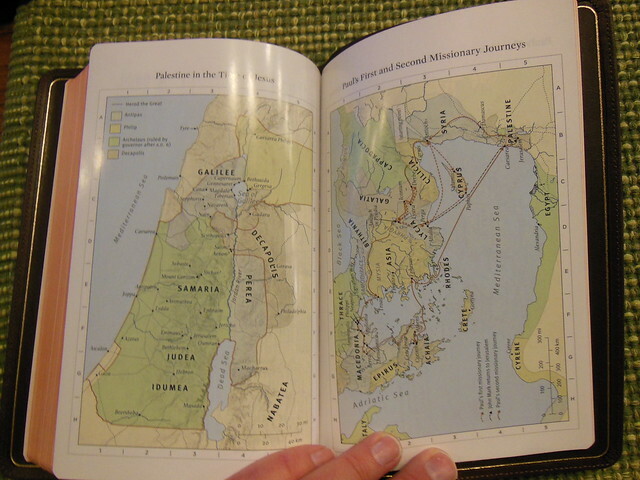 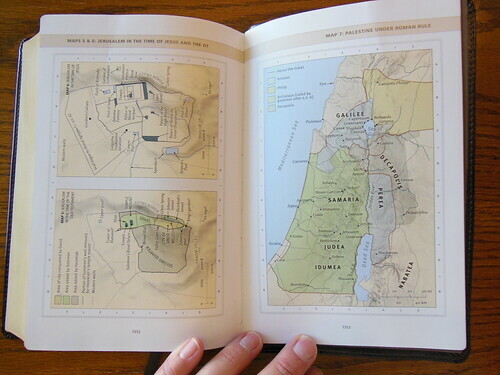 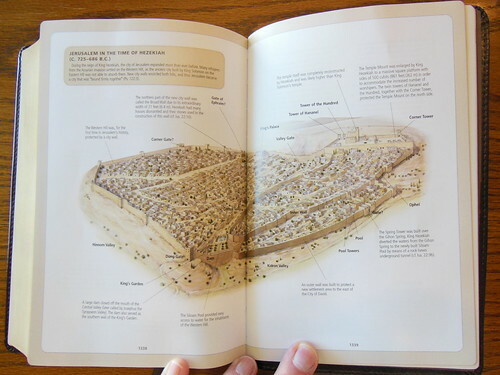 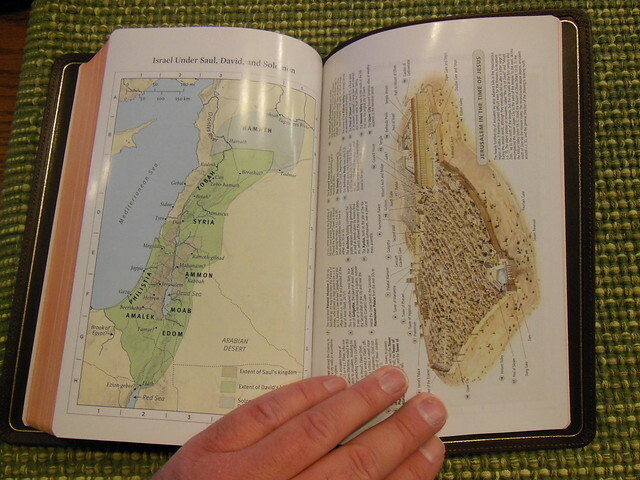 This edition adds 32 pages of full-color maps of Bible lands and illustrations of historic biblical sites, structures, and objects for ready reference and insight. 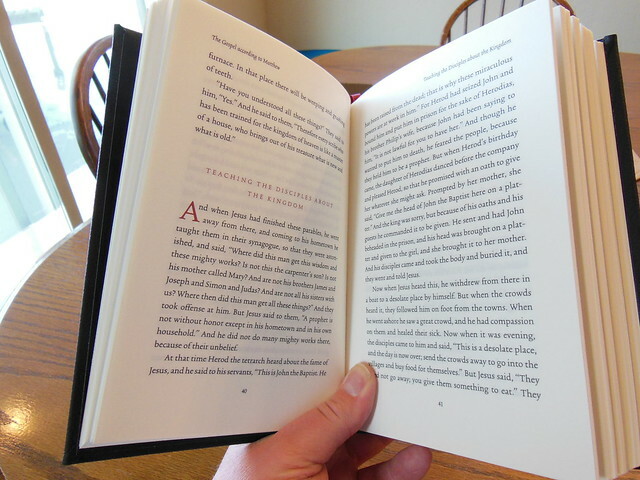 The ESV New Classic Reference Bible’s balance of helpful reference features and convenient size make it an ideal Bible for everyday use—at home, at church, at school, and on the road.